In the early days of the railways passengers travelled in four wheel carriages which had a core design based upon horse-drawn stagecoaches. As time progressed and newer passenger carriages were introduced the older fleets were usually either sold off or scrapped. Sometimes those which were sold off found new lives as outbuildings on farms, garden sheds, converted to summer holiday accommodation, beach huts, and other uses. In this guise they often survived for many decades, albeit with their wooden bodies slowly slipping into states of ever-increasing decrepitude. 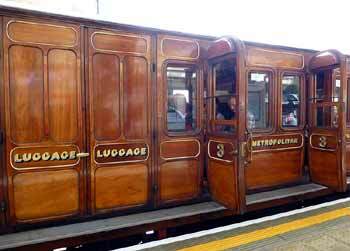 One (of the many) railway companies which built such carriages was London's Metropolitan Railway (the Met). 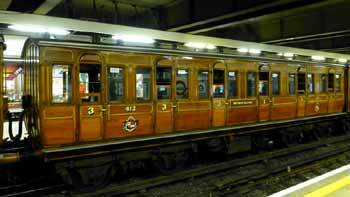 In 1887 the Met introduced the first of a fleet of four wheeled passenger carriages of a type that it called Jubilee carriages. This name was in honour of Queen Victoria's Golden Jubilee which was being celebrated in the same year. Rather than replace any existing carriages the new fleet was needed for network expansion along a new route which extended many miles through rural England from London to the country towns of Chesham and Aylesbury. 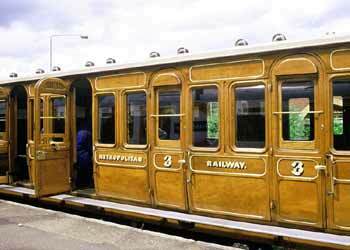 The Jubilee carriages comprised wooden bodies which were mounted on fixed iron frames. 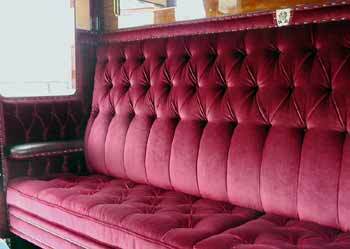 Whilst first class passengers were offered luxuriously furnished accommodation and second class passengers enjoyed modest comfort, the accommodation for third class was austere, with hard, cramped wooden benches. 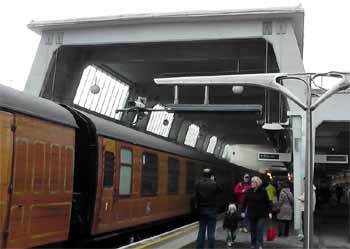 At least though the latter still had roofs - unlike some third class carriages introduced by the Great Western Railway in the very early days of the railways. 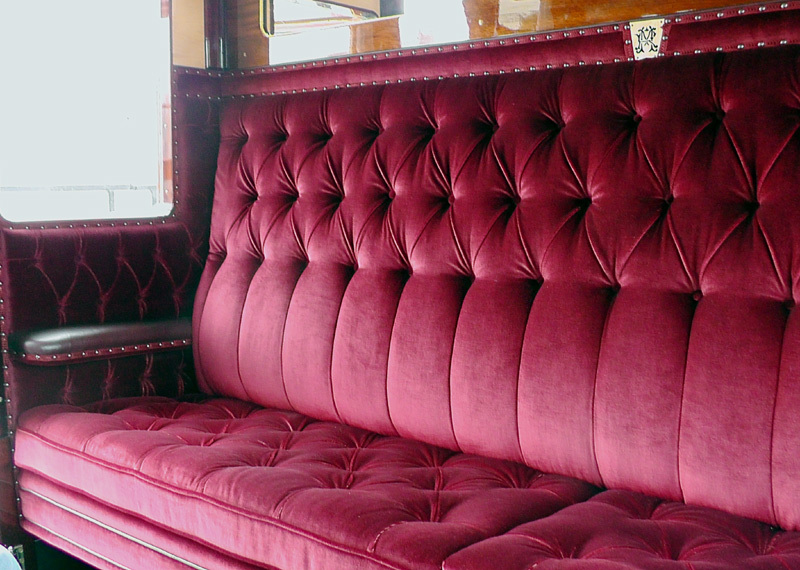 Amazingly, the body of Jubilee carriage No. 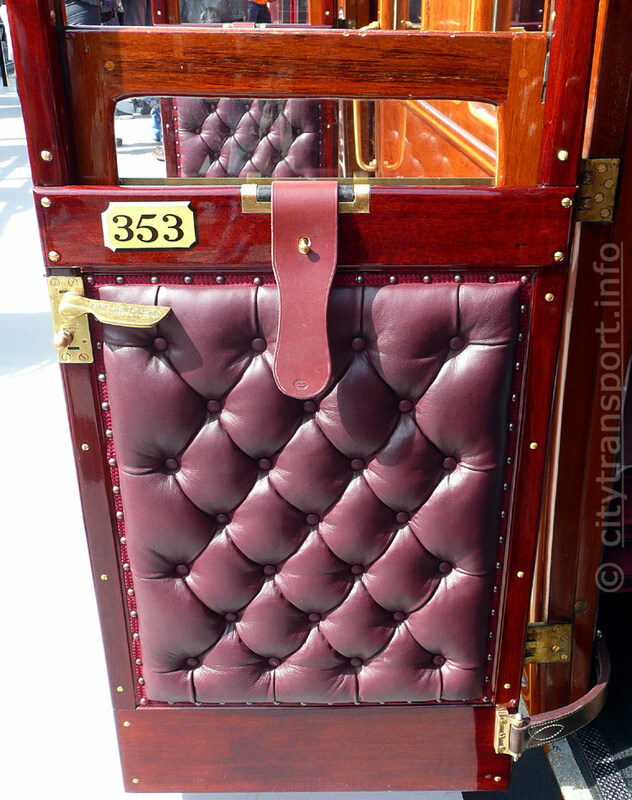 353 which dates from 1892 and was built for passengers travelling first class managed to survive to the present-era. Whether this was by sheer fluke or divine decree will never be known, Very briefly, No.353's history is that in 1906 it was sold to another railway and after further service the wooden body ended up as a shed on a farm. Restoration works began in 2011. Unfortunately the underframe, wheels etc., did not survive, so the body now sits on a suitable four wheeled underframe which came from former British Rail (Southern Region) PMV No. 1746 and was kindly donated by the Quainton Railway Society. 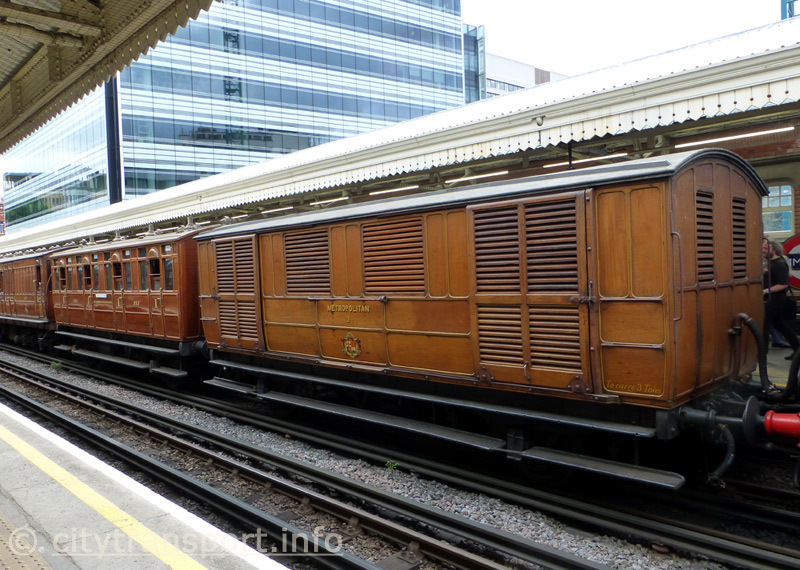 The PMV (Parcels and Miscellaneous Van) was a design of rolling stock that was first built by the South Eastern and Chatham Railway (SE&CR) in 1919. 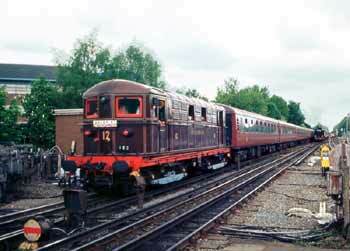 Later examples were also built by both the Southern Railway and until 1951, British Railways. Nowadays No.353 is in semi-retirement as an exhibit at the London Transport Museum Acton Depot, however it usually sees active duty carrying fare paying passengers on days when either the London Transport Museum Heritage Train or the Metropolitan Vintage train are also carrying passengers on portions of the London Underground subsurface network. Sometimes this is together with a Metropolitan Railway milk van which had always remained in railway ownership and has also been made available so that people of the present era can see and learn about how the railways of yesteryear served the British people. Further reading / information sources: . 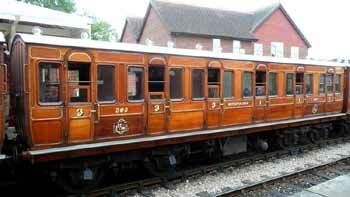 As an aside, the Met also had other fleets of four wheel carriages, however none of these are known to have survived. 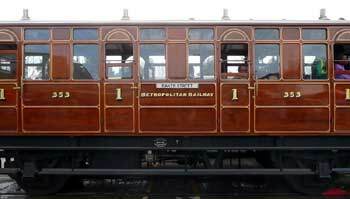 The Metropolitan Railway withdrew the last of its four wheel carriages from service in 1905, when it converted its urban services from steam to electric traction. 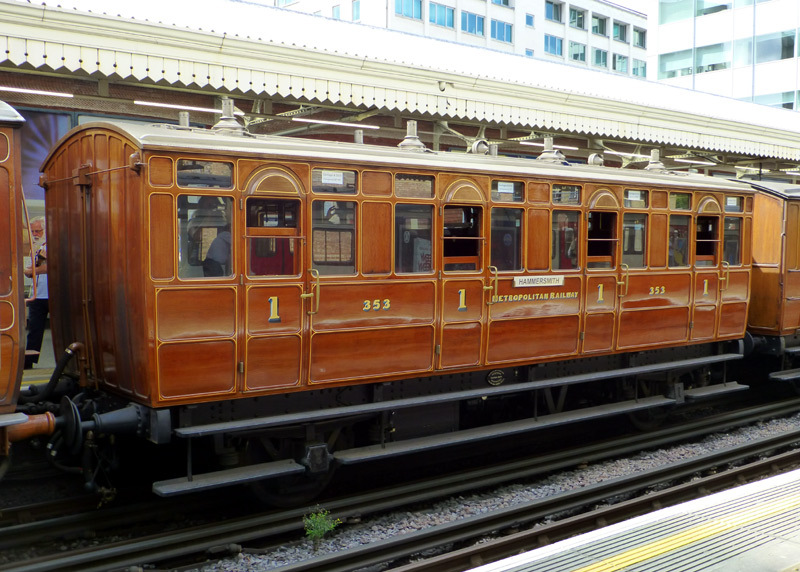 Metropolitan Railway Jubilee carriage No.353 at Hammersmith (Met) station when it was carrying fare paying passengers (who had bought a special ticket in advance) during a 2014 Steam On The Met event which celebrated 150 years of the Hammersmith & City Railway. The Hammersmith & City Railway was a joint venture between the Metropolitan Railway and the Great Western Railway. The line was dual gauge and when services first began the Great Western used its extra wide broad gauge trains. The route started at Westbourne Park station and extended to the suburb of Hammersmith, albeit at a different terminus station than is used nowadays. The next few views show No.353 when it was one of the many exhibits at a London Transport Museum (LTM) Acton Depot open day. Side view. It was not possible to stand far enough away to photograph a side view of the entire carriage. The builders plate on the solebar. 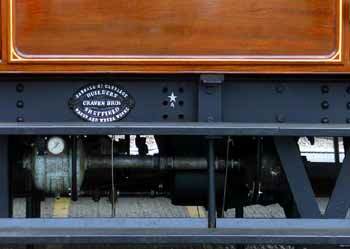 As explained in the text above the underframe comes from a different item of rolling stock. 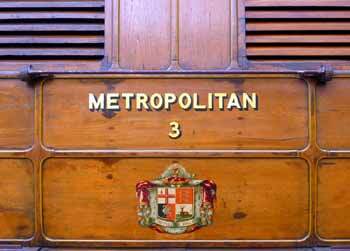 Each seating bay also includes the Metropolitan Railway MR logo. The ceiling inside one of the former smoking compartments which has two extra ventilators. 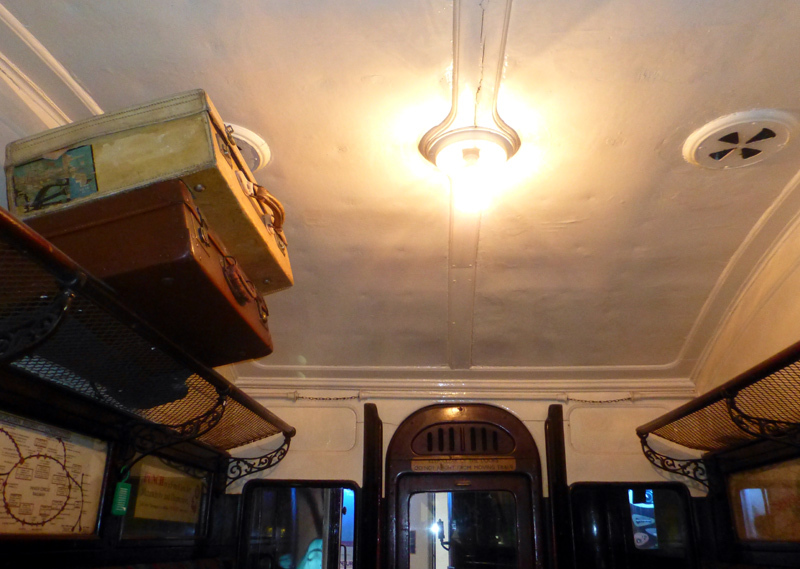 Originally these carriages used pressurised gas lighting, however when refurbished it was found that electric LED lights offered a visually similar but much safer way to mimic the appearance of gas mantles. As this is a first class compartment it has two lights - second and third class passengers had to manage with just one light per compartment! and compose the image to be taken. 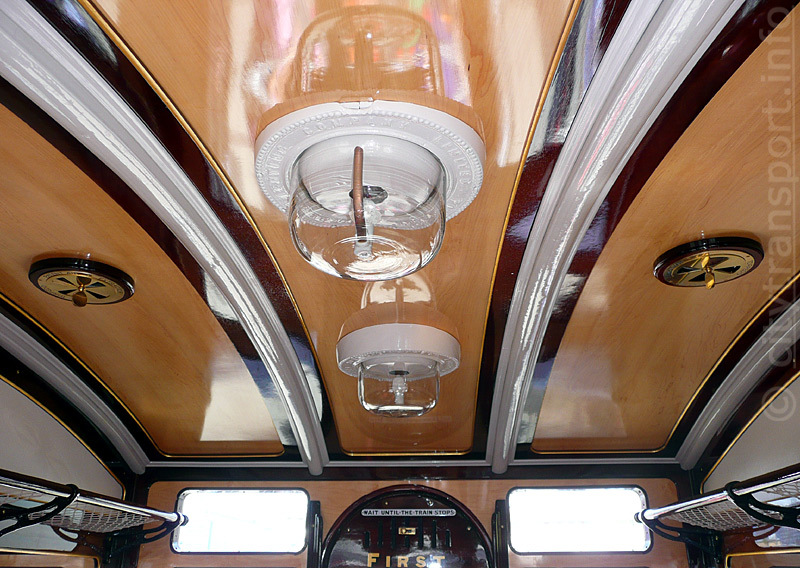 This view also shows just how reflective polished wood can be! 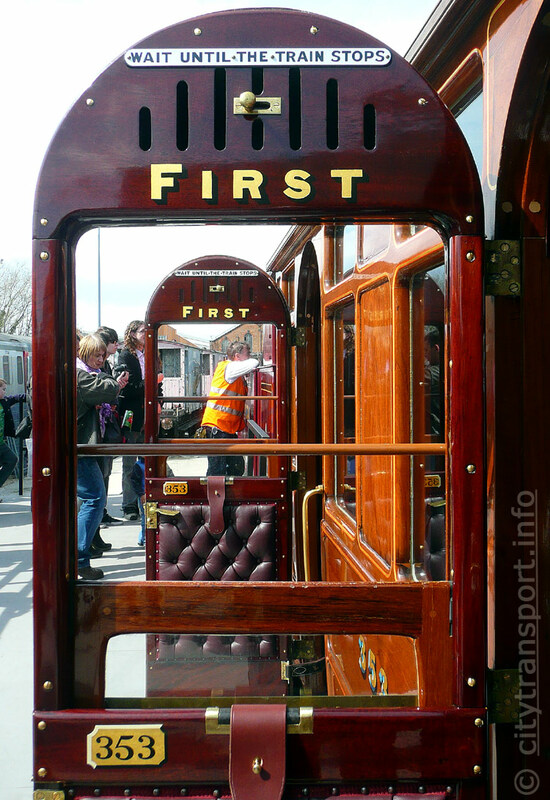 This carriage was beautifully restored by the Ffestiniog Railway, with the work being partially funded by the Heritage Lottery fund. The door lock plus builder's details and a closer view of the deeply buttoned fabric and braid trimming. 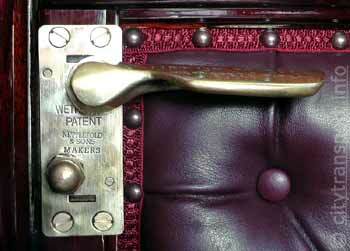 A second view of the door lock, this time showing the instruction on how to open the door. Apart from commonsense there would be nothing to prevent the door from being opened between stations. The lower part of an open door. The upper part of an open door. hit a tunnel wall on the subterranean section of track south of Finchley Road station. it would be appropriate to use No. 353 as a shaded seating area where they could talk with friends, relatives, etc. No.353 was coupled to a former Metropolitan Railway milk van which also survived to the present era. Behind these two vehicles is part of the narrow gauge train which was offering joyrides to young children. Including the moving train in this image was useful in masking the queue of people waiting for their turn for a joyride! 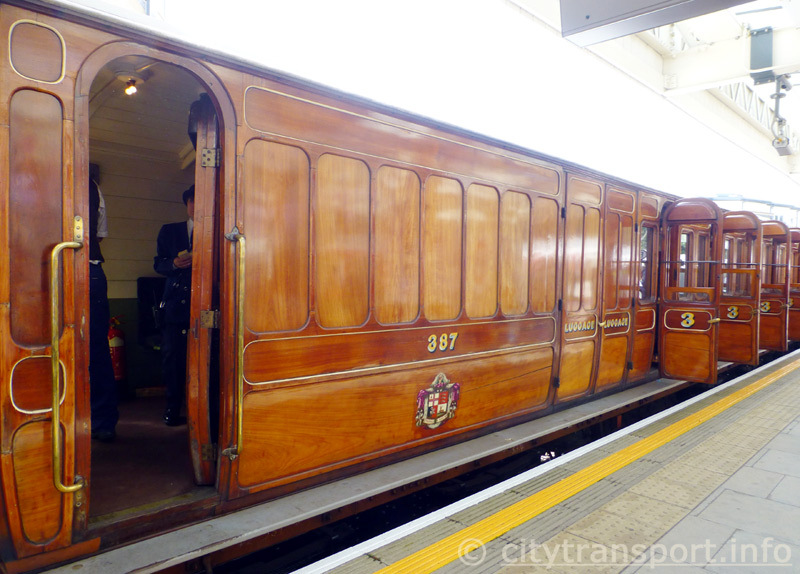 On 2nd December 2013 Jubilee carriage No.353 was included in a special non-passenger staff training train which travelled to Uxbridge prior to a planned "Steam On The Met" event. What is most remarkable is that each of the three locomotives which powered this train used a different traction system - these being steam, diesel and electricity. The triple-powered train is seen passing Rayners Lane junction, which is where the Metropolitan and Piccadilly lines join. The triple-powered train is seen after having been brought to a halt at a red signal whilst passing through Ruislip station. it is possible to see the extra ventilators for the two smoking compartments. 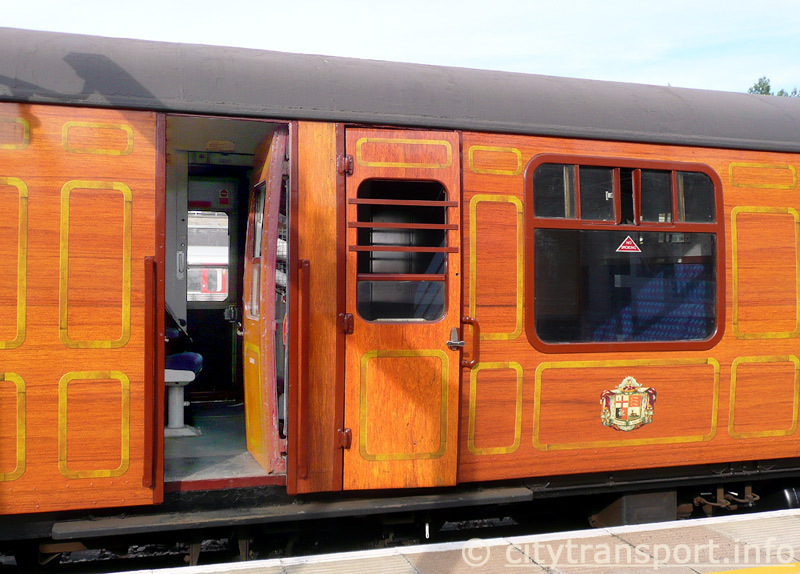 Another time when Jubilee carriage No.353 was run on its own (ie: as the only passenger carriage) was on 28th November 2013 when it was included in a train that was powered by battery locomotives Nos. 25 and 45 and Metropolitan Railway steam locomotive No.1. 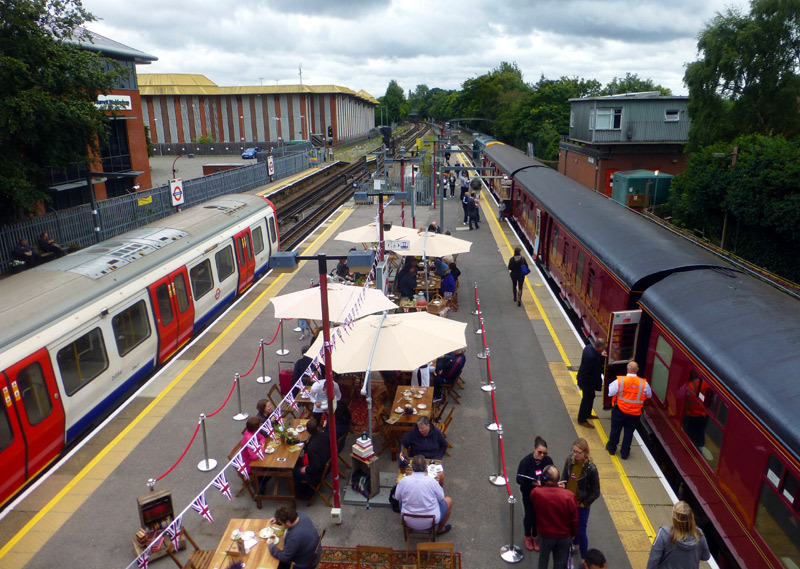 The train was travelling from Ealing depot to Ruislip depot in advance of the final steam train special event of the 2013 celebrations of it being 150 years since the 1863 opening of the first section of the Metropolitan Railway. Although not illustrated on this page it is possible to watch a short video of the train departing from Ealing Common depot and passing through the adjacent Ealing Common station. Built by the Birmingham Carriage & Wagon Company, Metropolitan Railway milk van No.3 dates from 1896. Its purpose was to carry fresh milk from dairy farms in Hertfordshire and Buckinghamshire to London. It was withdrawn in 1936, after which it became Breakdown Van No. BDV700. 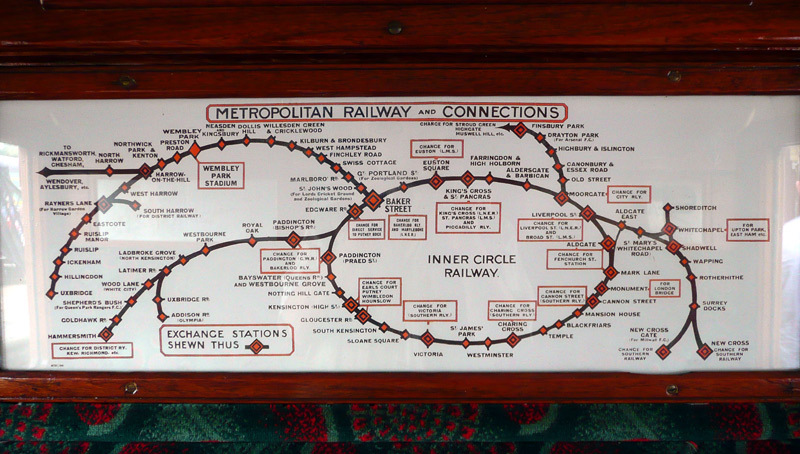 In the early 1960's it was restored back to its original condition so that it could be included in the 1963 centenary celebrations of the London Underground. After that it was displayed at museums and stored (out of sight) at other places. 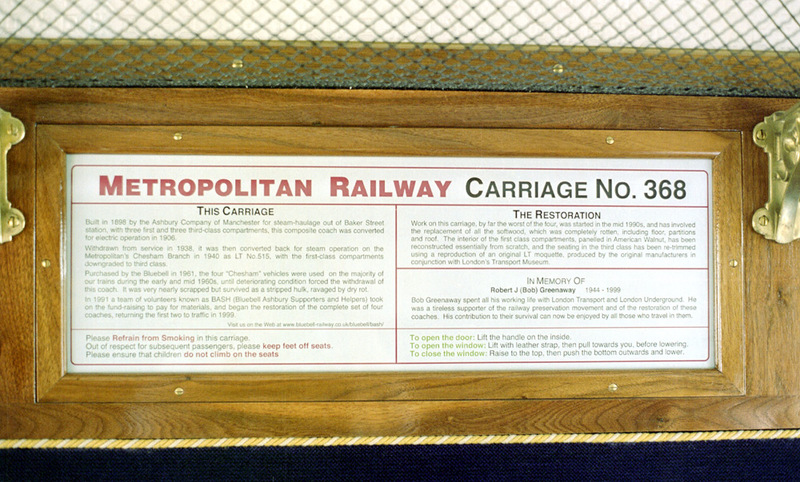 In 2012 it was overhauled so that it could be included in the January 2013 heritage celebrations for the 150th anniversary of the Metropolitan Railway. The purpose of milk vans was to carry churns of fresh milk directly from dairy farms to nearby town and cities. They were usually attached to fast passenger trains and despite being a type of goods wagon they were built with additional suspension to reduce the likelihood of the milk starting to turn into butter during the journey. To help keep the milk fresh milk vans were 'ventilated', which means that they were designed to allow outside air to flow through them as they travelled. Airflow would pass through the wooden slats located on all four sides, including on the sliding doors. Although not intended to carry human passengers should anyone be travelling inside it would feel as if the windows were open wide... the word 'draughty' comes to mind! Milk van No.3 alongside Jubilee Carriage No.353 at a LTM Acton Depot open day. One of the sliding doors. The railway company name, the vehicle fleet number and the railway company coat of arms. The central section includes the insignia of the four counties which the Metropolitan Railway served, these being (clockwise from top left): the City of London, Middlesex, Hertfordshire and Buckinghamshire. Jubilee Carriage No.353 and milk van No.3 at Hammersmith (Met) station, as seen in 2014. Next to No.353 is Ashbury Brake third No.387, this is part of the Metropolitan Vintage Train, as described below. pass through Royal Oak station whilst travelling from Hammersmith to Moorgate. The Metropolitan Vintage Train comprises original Metropolitan Railway wood-bodied passenger carriages that date from between 1898 and 1900. 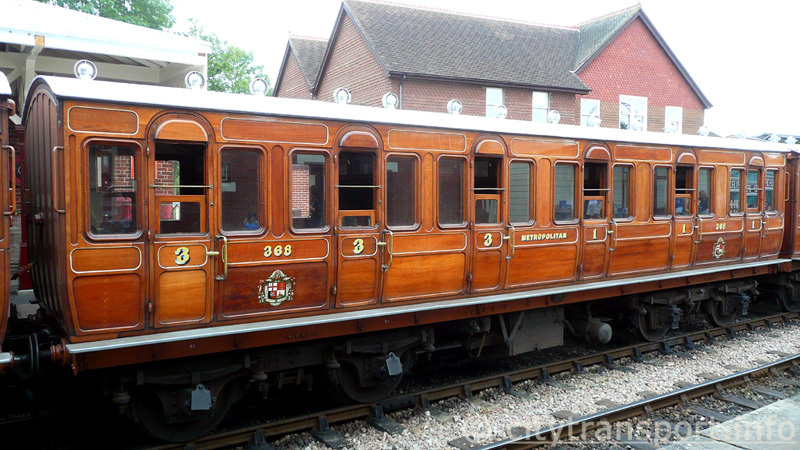 To differentiate them from the four wheel carriages (such as No.353) which they replaced, the Metropolitan Railway named them as Bogie coaches. This would have been because the carriage bodies were carried on two four wheel bogies. 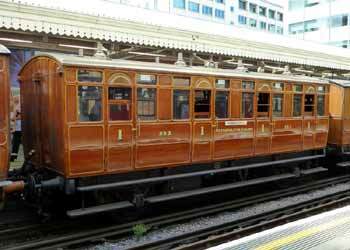 In 1905 the Metropolitan Railway started to electrify its urban services and the period 1906 - 1921 saw some of these Bogie carriages being rebuilt for electric traction and fitted with train drivers cabs. Most of the fleet was withdrawn from service as new electric trains were introduced in the late 1930's, but with war looming they were only stored in case of emergency - and not scrapped. In 1940 six Bogie carriages were re-purposed and rebuilt (again) for use on push-pull (autotrain) shuttle services between Chalfont & Latimer and Chesham. The conversion from self-powered electric traction to steam haulage included removing their electric motors and control gear (where fitted) plus replacing electric train driving controls with those suitable for controlling trains where a steam locomotive is at one end of the train. Formed as three-car trains the two trainsets were rostered for weekly cycles where one set was in service and the other set was in the depot for maintenance. The steam locomotives used when in autotrain mode were provided by the London & North Eastern Railway (LNER) who called them type C13. They were built in several batches between 1903 and 1905 by the Great Central Railway (GCR) who called them type 9K. 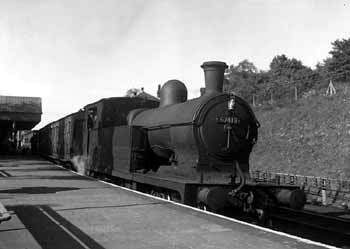 This 1957 photograph shows a class C13 4-4-2T locomotive and Ashbury passenger carriages at Chesham with a train for Chalfont & Latimer. The visible ventilation grilles on the carriage nearest to the steam locomotive suggests that it might be Brake Third Bogie coach No.387. Image & license: © Dr Neil Clifton / Geograph Project. CC BY-SA 2.0 http://www.geograph.org.uk/photo/470211. 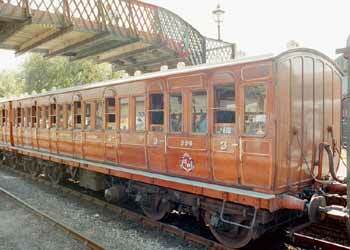 These carriages were finally withdrawn in the early 1960's, when the route to Chesham was electrified. 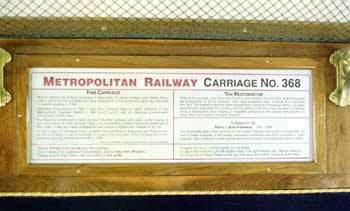 One carriage was reserved for the London Transport Museum, where it is still to be found. 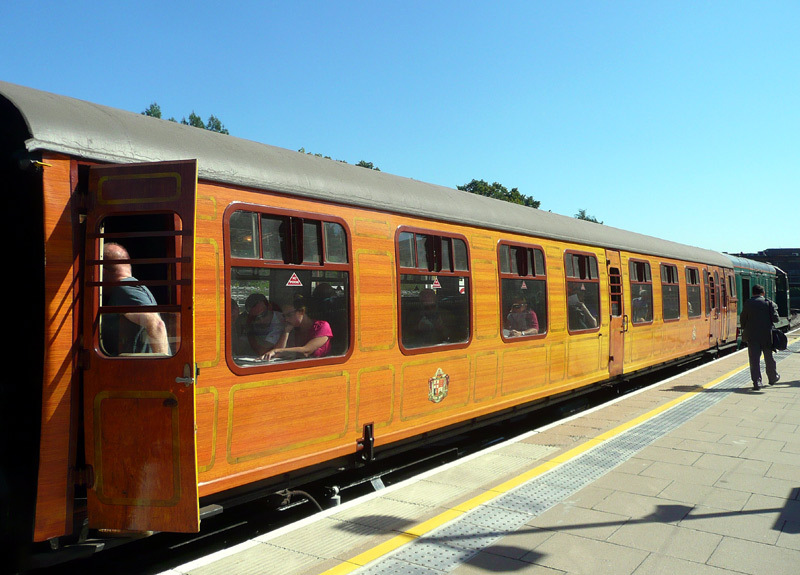 The other carriages probably would have been scrapped but the then fledgling Bluebell Railway was in urgent need of rolling stock and with finance in short supply it chose to buy four of the remaining carriages from London Transport because the purchase price was considerably lower than the amount British Railways wanted for its old passenger carriages. The other remaining carriage was scrapped. This was a carriage which in 1899 had been rebuilt as a motor coach in the experimental electric train that helped validate electric traction as being a viable solution. 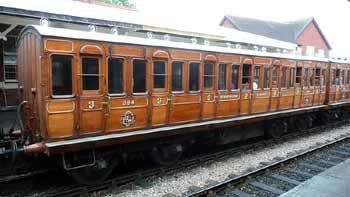 The carriages which the Bluebell Railway bought have became known as the Chesham Set, which of course refers to the service on which had been operating. 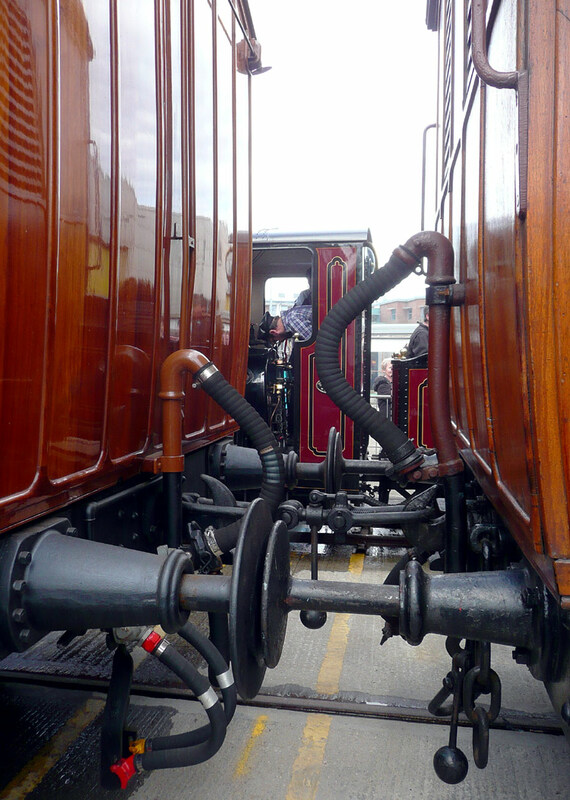 They include two carriages which at one end had normal couplings for attaching to locomotives and at the other ends special close couplings which were only compatible with other carriages that had similar close couplings. 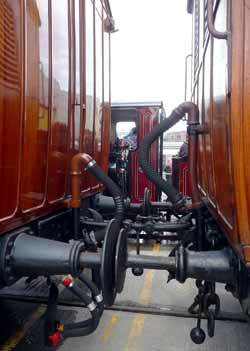 The other two carriages had close couplings at both ends. 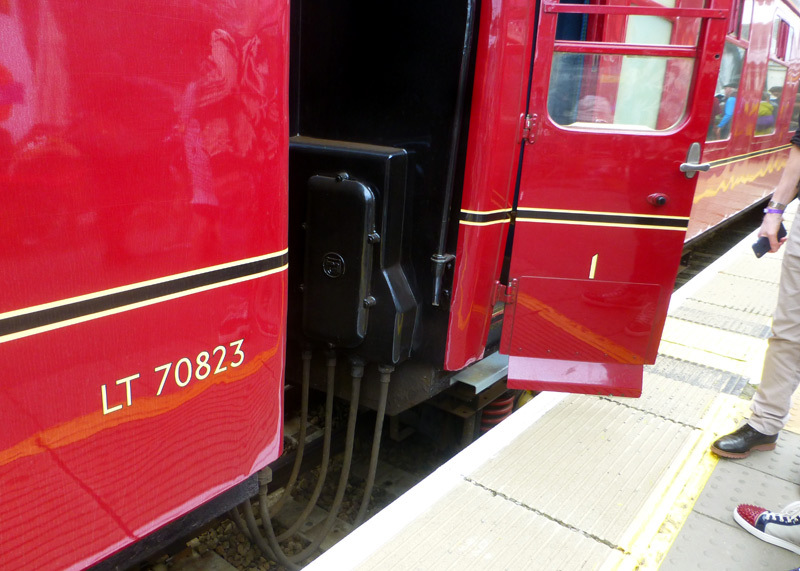 The purpose of the close couplings was to reduce the wasted space gap between carriages, so that it could be used to increase the train's passenger capacity. The same philosophy was also used during the advance design process of the fully articulated walk-through S Stock trains which have totally eliminated the gap between passenger carriages and since 2011 have been operating some of the services that at one time these trains wooden trains provided. For the fledgling Bluebell Railway the Chesham Set was a godsend, as not only did they help make it possible for them to earn much needed funds through carrying passengers - and hence also become more established as a business - but it offered discerning passengers the choice of a type of train that (in those days) was not available on any other preserved railway. Even though now owned by the Bluebell Railway the Chesham Set was briefly welcomed back to London in 1963 when it joined in the Centenary celebrations of the Metropolitan Railway. As the 1960's progressed and the carriages aged, leaking roofs and rotting wood eventually required them all to be taken out of service for repairs. For over 25 years this trainset was stored at the back of a carriage shed where it found a use as storage space for various items from other trains. The full story of how and why they came to be restored can be read on the Bluebell Railway BASH web pages which are dedicated to these carriages; this can be reached at one of the links below. Perhaps of special interest will be the web page which is based upon an 1898 article published in The Engineer that includes a very detailed description of the (then) brand new carriages... dimensions, heating system, lighting, materials used, braking system and more. 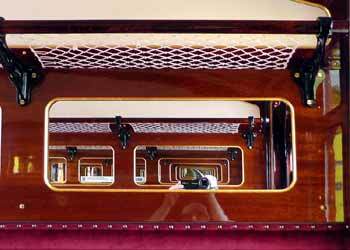 The information about their interior furnishings describes in much detail about how the compartments for the three classes of travel were differently furnished with increasing degrees of luxury. Unfortunately what remains unknown is the split between the three classes - the more spacious compartments suggests that possibly the composites were originally split between first and second class with the rest of the train being for third class passengers. The Bluebell Railway has a large collection of both historic and vintage rolling stock. The trains in service vary according to whether it is a special event day or normal service day. Full details can be found at the website (see below). 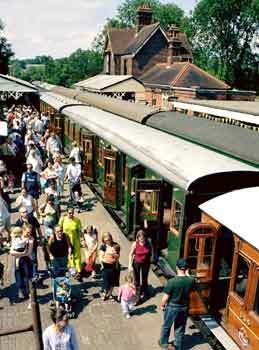 The Chesham Set carriages are used as part of their Victorian Train alongside other passenger carriages of significant vintage, including some four wheel carriages which originated on other railways in southern England. 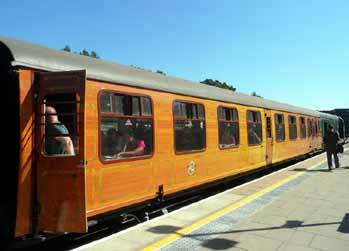 Located on the border between east and west Sussex the Bluebell Railway's line is 11 miles (17.7 km) in length and in addition to several historic / restored stations the route includes a tunnel where it is possible to sample the dim night-time illumination inside the trains. 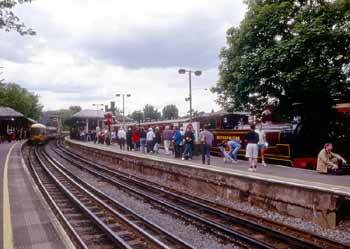 The Bluebell Railway is easily reached by present-day normal service trains at East Grinstead station. In 2007 the restoration of the Chesham Set was applauded as one of the most significant carriage restoration projects in the history of the preservation movement. 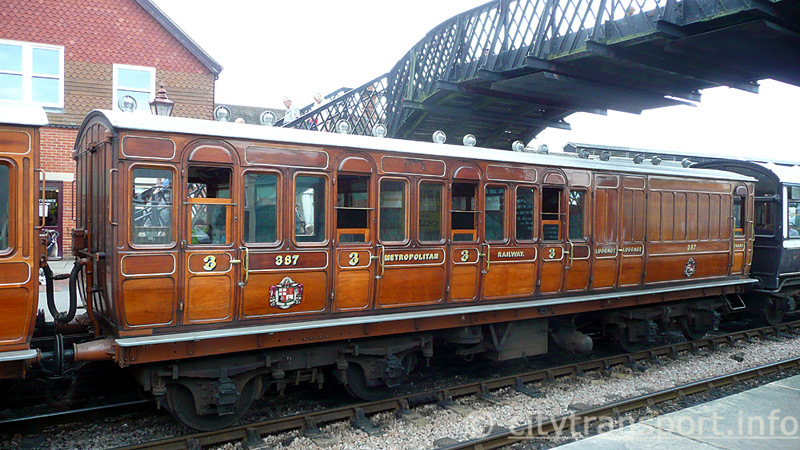 Although the more recent restoration of Gresley's London and North Eastern Railway (LNER) 1924 Quad-Art articulated carriages for the North Norfolk Railway means that the Chesham Set is no longer the only close-coupled set of preserved historic passenger carriages in the UK, the Chesham Set remains the oldest matching set of passenger carriages still able to carry passengers in the UK and when being transferred between the Bluebell Railway and London Underground these four carriages are the oldest fleet of passenger carriages that are allowed to travel on our mainline railway system. Why Celebrate Trains From An "Urban Metro"? Readers who know little of the history of the Metropolitan Railway and only understand concepts such as urban metro, commuter rail, long distance trains, etc,. may be somewhat perplexed to find that some historic passenger carriages which were built by what (using present-day terminology) they would think of an an urban metro should be held in such high esteem with respect of the entire British railway train system. 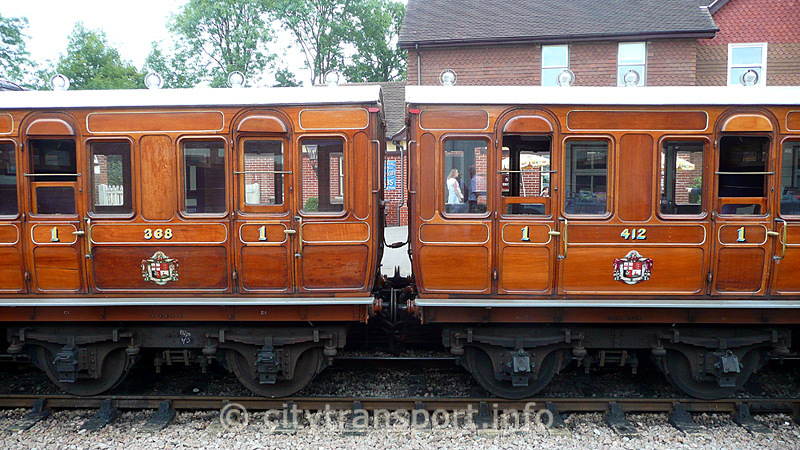 The answer is that these four passenger carriages are seen as being special because not only are they some of the oldest original rolling stock to have survived to the present era (ie: not pastiche replicas) but that there are enough of them to form an authentic trainset - rather than just single carriages. As for the Met having been what nowadays is seen as an urban metro, it is necessary to look back to the early days of Britain's railways. The Metropolitan Railway dates from a time when there were over 100 independent railway companies here in the UK and with few - if any - of the present-day marketing labels for different types of passenger service having been invented, the railways were seen as railways - and nothing more! Whilst the Metropolitan Railway is famed for being the first railway which for much of its route travelled through tunnels below city streets, once it became established it quickly started to operate other services which were identical to the many other railways here in the UK. In addition to passenger trains (some local, some longer-distance express) it ran goods (freight) trains, it had branch lines, main lines, longer distance trains with Pullman Cars that offered freshly cooked light refreshments, and more. The decline of the Met into its present-day format primarily came about because the British government introduced a law that forced the Met to be merged into a new London-wide transport organisation known as the London Passenger Transport Board (LPTB) who quickly set about closing some of the Met's rural services and hiving off the functions they did not want to operate to a different railway company (eg: goods services). The photographs showing the Chesham Set / Metropolitan Vintage Train date from 2000 - 2015. This includes at Rickmansworth station in 2000, visits to the Bluebell Railway in 2003 and 2012 and when they were in London in 2013, 2014 and 2015. During the year 2000 "Steam On The Met" event Metropolitan Railway steam locomotive No.1 plus the first two of the fully restored carriages (Nos. 368 and 394) were placed in the little-used (and now disused) bay platform at Rickmansworth where they acted as static exhibits which showcased the ongoing refurbishment of the fleet and to help raise funds to complete the remaining two carriages. In January 2013 and August 2014 the Metropolitan Vintage Train took part in celebrations for 2013 being 150 years since the 1863 opening of the Metropolitan Railway and 2014 being the 150th Anniversary of the Hammersmith & City railway which opened in 1864 - and is now served by Hammersmith & City and Circle Line trains. 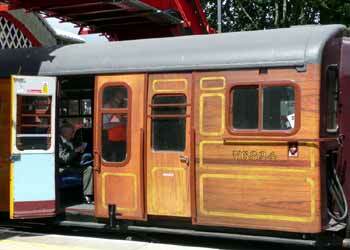 Also included in these trains were Jubilee carriage No.353 and milk van No.3. These trains were powered by the historic Metropolitan Railway steam locomotive No.1 and Metropolitan Railway electric locomotive No.12 Sarah Siddons. What was most remarkable is that steam locomotive Met 1 was actually in steam, with these journeys (and the trial runs plus staff training trips in the months before the main event) possibly being the only times that a steam locomotive which was in steam had travelled through the tunnels which form the northern and western side of the Circle line in the last 100 years. For each of the two events the special train made multiple journeys spread over two days. All journeys travelled west from Moorgate station along the original subterranean section of the Metropolitan Railway, with some journeys ending at Edgware Road station and others travelling onward to other western destinations which varied according to the special event timetable. During the second event in January 2013 there was also one journey which because of a points problem at Edgware Road had to make an unscheduled trip to Gloucester Road station (via High Street Kensington) in order to reverse its direction of travel. Although the route to Gloucester Road is no longer served by the Metropolitan Line, it was originally built by the Metropolitan Railway. So despite the cause having been 'a problem' it could be seen as being appropriate that the historic train made this unscheduled journey. Although there were many well-wishers who had travelled specially to see (and film) the special train, there were also many genuine and unsuspecting passengers whose faces displayed utter astonishment when they saw it, complete with a live steam locomotive, passing through the stations where they were waiting on the platforms. What they told their friends and families when they returned home can only be imagined! In September 2015 the Metropolitan Vintage Train plus Jubilee carriage No.353 and milk van No.3 took part in a "Steam On The Met" event which travelled between Amersham and Watford stations via a little used section of railway (known as the North Curve) between Rickmansworth and Croxley stations. At Watford passengers were able to enjoy afternoon tea in a pop-up tea room located on the station platform. To further enhance the proceedings there was some 1940's era background music. Most images below are in 4:3 format, however especially for the external views of the longer carriages the camera was set to 16:9 format instead. "Steam On The Met" event. Also seen is a northbound Chiltern Railways Class 165 diesel multiple unit train in Network SouthEast livery. A side view showing predominately coach No. 394 and steam locomotive Met No.1. An unobstructed view of part of Ashbury Carriage No. 394. The window glass reflections include of part of a Rickmansworth station name board and an A stock train which was calling at another platform at the same time as this photograph was being taken. Full third carriage No.394, as seen in 2003 whilst in passenger service on the Bluebell Railway. This 2003 view includes Ashbury carriage No.394 operating alongside some former Southern Railway third class 100 seater carriages. These were so named because they have 10 compartments per carriage, each of which can seat 10 passengers (five a side). 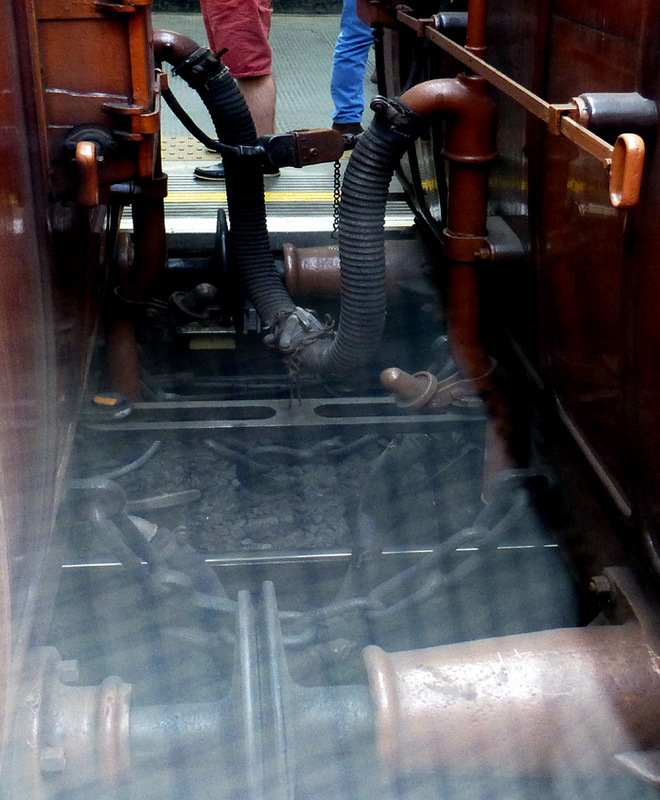 Although unfortunately spoilt by window reflections, this view which looks between two of these carriages shows a close-coupling bar. Especially on warm summer days it was not unusual for alighting passengers to leave the doors open when at terminus stations. This was seen during the 2015 Steam On The Met event when the train was at Watford (Met) station. A Metropolitan Railway route map, probably from after 1926. This image was taken whilst passing through the Bluebell Railway's 731 yards / 668 metre Sharpthorne tunnel. This was a very busy day with many trains in operation. 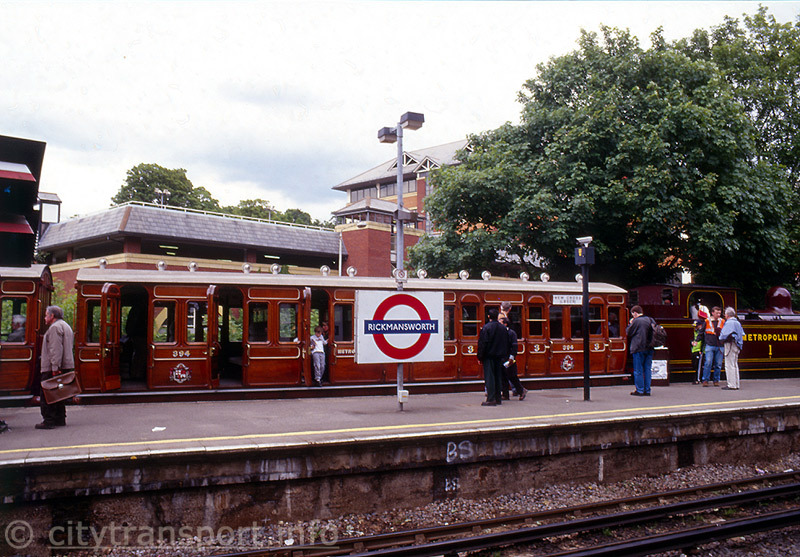 Three of the Chesham Set carriages are seen in service, albeit near the end of the film. This link leads directly to the train which has the Chesham Set carriages, showing this train departing from a station. 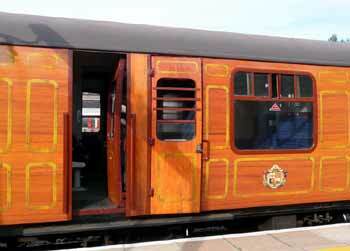 This seven compartment carriage was built at the Ashbury Railway Carriage & Iron Co. of Manchester (Ashburys) in 1900. 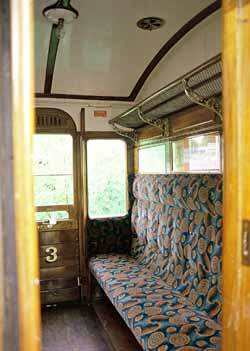 In 1921 the outer end compartment was rebuilt as a driver's cab of an electric multiple unit train. 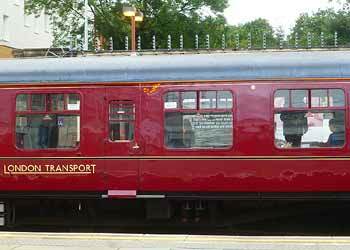 In 1940 this carriage was further rebuilt to become a push-pull control (ie: driving) trailer for the steam powered Chesham service. 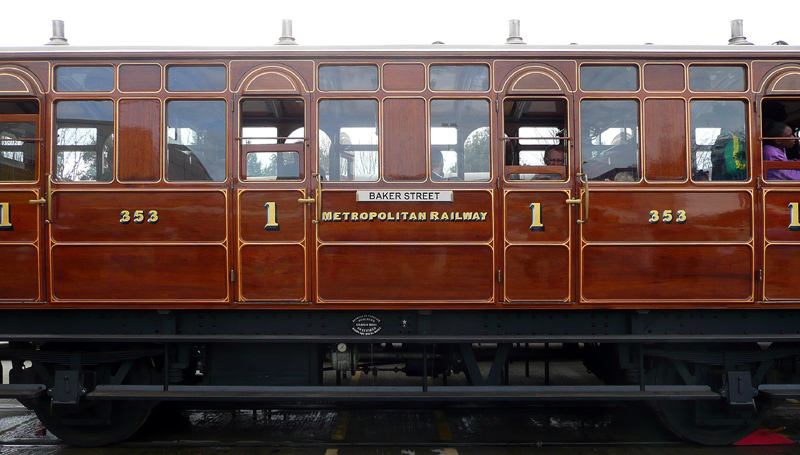 Although nowadays restored to its original format, Ashbury carriage No.400 at the London Transport Museum shows what this carriage would have looked like after it was rebuilt as a control trailer (this is seen below). Looking inside the functional but rather austere third class compartment. Note the fully upholstered single full-width bench type seating. The lighting was battery electric. This five compartment carriage was built at Ashburys in 1898. In circa 1907/8 it was rebuilt as an electric driving motor coach with four compartments and electric control gear in part of the luggage area. It was soon realised that there was now insufficient luggage space and a passenger compartment was converted into a guard's and luggage compartment. 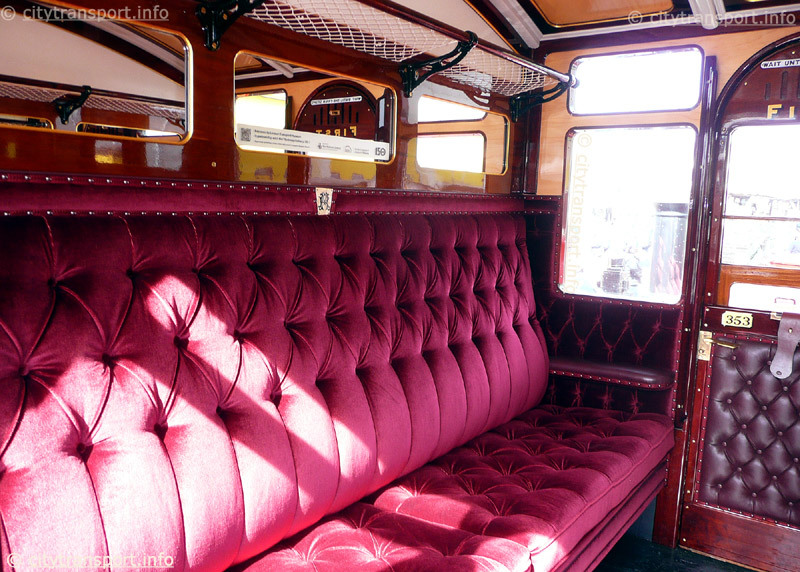 In 1940 the removal of the electric motor equipment in the brake van area meant this space was now available again for luggage, so the fifth compartment was restored back to passenger use. 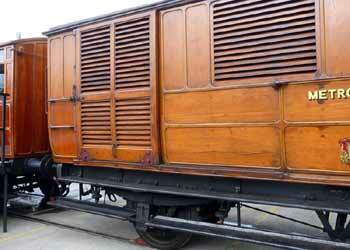 The conversion to an electric motor carriage extra including fitting ventilation grilles to the brake van area. These were removed and the original side panels reinstated by the Bluebell Railway as part of preparations for this carriage to be used in a BBC filming project. The guard and luggage end of Brake Third carriage No.387. The other end of this carriage. 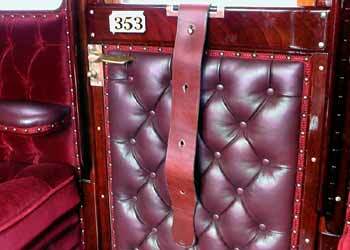 At the brake end No.387 is coupled to London & North Western Railway (LNWR) 1913 third class Observation Coach No.1503. The guards' door is open and we peek inside. This view of the guards' door on Brake Third No.387 was taken whilst standing in the part of an S Stock train which is dedicated to people who use wheelchairs. 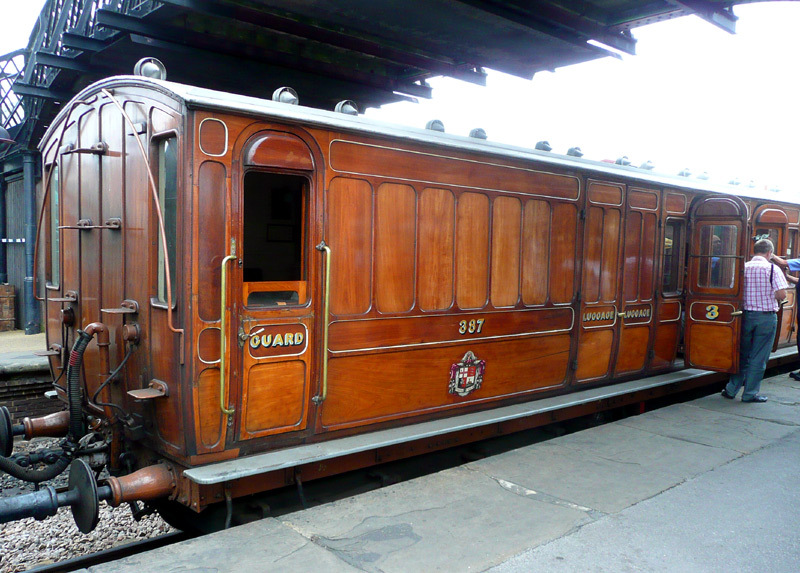 In addition to showing the end glazing on the brake carriage it acts as a reminder that whilst nowadays people who can not walk travel with everyone else, there was a time when the only part of a train which was accessible to wheelchair passengers was the unheated goods area next to the guards's compartment. 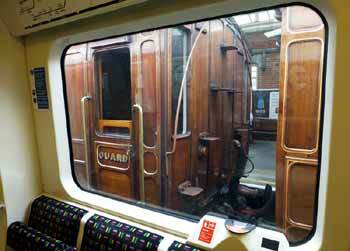 More about carriage 387 and its restoration. 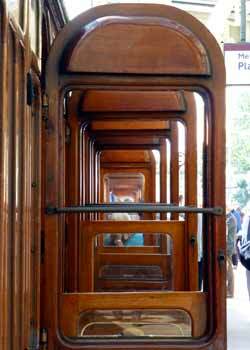 This six compartment carriage was built at Ashburys in 1898. It seats 24 first class passengers in three spacious compartments and 30 third class passengers in the other three compartments. Between 1906 and 1940 this carriage was part of an electric multiple unit train, for the rest of its life it was part of a locomotive hauled steam train. As part of the 1940 conversion for Chesham services the first class compartments were downgraded to third class and the folding arm rests were removed. These were reinstated as part of the BASH restoration project. 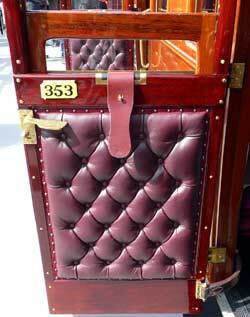 First / third composite Ashbury carriage No.368. 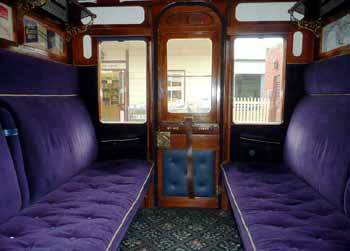 Some of the first class compartments in carriages Nos.368 and 412. First / third Composite Ashbury carriage No.368 and an arriving S Stock train at Hammersmith (Met) station. make for a stark contrast with trains of the present era! Looking through a train window whilst at a station and seeing another train on an adjacent track is not normally noteworthy, however the view seen here is one which it will not be possible to replicate too often. Whilst S stock trains do have many comfortable features they are still standard class... first class was withdrawn from the Metropolitan Line in 1941, as a wartime economy. It was never reinstated. More about carriage 368 and its restoration. Clicking this link will open a version of this photograph (in a new window) where it will be just about possible to read the text in the image . Because Ashburys had full order books so were unable to accept the extra work, this six compartment carriage was built at Cravens, in 1900. It seats 24 first class passengers in three spacious compartments and 30 third class passengers in the other three compartments. Between 1906 and 1940 this carriage was part of an electric multiple unit train, for the rest of its life it was part of a steam train. First / third composite carriage No. 412 at platform 4, Moorgate station. Part of the LU150 timewall can be seen in the background. Looking inside a first class compartment in carriage No.412. A different view inside the same compartment. Some videos showing the Metropolitan Vintage Train in action (together with Jubilee carriage No.353 and milk van No.3) have been placed on the ‘YouTube’ film / video website and can be watched (in new windows) by clicking the links below. The films are grouped according to event. Locomotives: In both January 2013 and August 2014 traction came from Metropolitan Railway Electric Locomotive No. 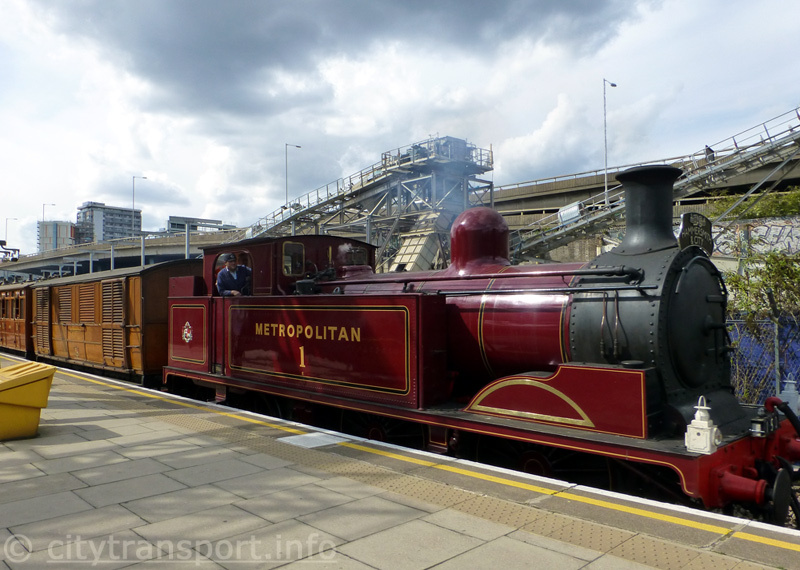 12 Sarah Siddons (built 1923) and Metropolitan Railway Steam Locomotive No. 1 (built 1898) which were located at opposite ends of the train. LU150 Steam Train passing through the District and Circle line platforms at Paddington Underground Station. This was the first journey of the day, the train was travelling from Kensington Olympia to Moorgate. 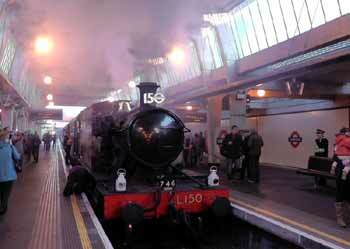 LU150 Steam Train passing through Kings Cross St Pancras Underground Station. 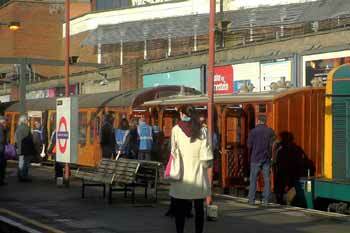 LU150 Steam Train Departs from Edgware Road subsurface Underground Station. LU150 Steam Train passes through Barbican Underground Station during a blizzard! LU150 Steam Train Baker Street Station Smoke / Magic Train Transformation. Sometimes in magic shows the act will include something which disappears in a puff of smoke and then after a flash of light re-appears totally transformed. This film shows just this happening at the iconic 1863 platforms at Baker Street station... it uses real smoke, real trains carrying fare-paying passengers, real flashes of light, real transformation, real magic, but no mirrors! The magic occurs at the end of the film. LU150 Steam Train passing through Wood Lane Station Underground Station. LU150 Steam Train passing through Royal Oak Underground Station (filmed both ways, also seen are some trains on the adjacent Great Western Main Line). LU150 Steam Train passing through South Ealing Underground Station (the last journey of the day, the train was returning to Northfields Depot). Locomotives: For both films below traction came from Great Western Railway 4575 Class Prairie Tank steam locomotive No. 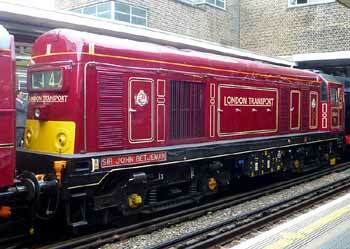 5521 (built 1927) in London Transport 150 livery, Metropolitan Railway Electric Locomotive No. 12 Sarah Siddons (built 1923) and Metropolitan Railway Steam Locomotive No. 1 (built 1898). 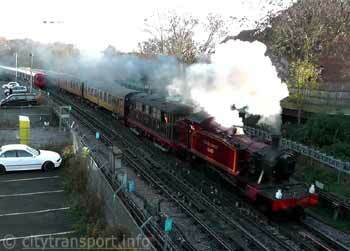 Steam Train Positioning Move - filmed on 12th August 2014 the Metropolitan Vintage Train and Jubilee Carriage No.353 are seen passing through Sudbury Town station whilst travelling from Northfields Depot to Ruislip Depot. Also seen is a 1973 Tube Stock Piccadilly Line train. Steam On The Met & Pop-up-Tea Room Filmed on Sunday 13th September 2015 the Metropolitan Vintage Train Jubilee Carriage No.353 and milk van No.3 are seen at Rickmansworth, Watford (Met) and Croxley stations plus crossing the Grand Union Canal near to Watford. Unusually, the Jubilee carriage and the milk van are at opposite ends of the train. Also of interest is the very loud whistle as the train arrives at Watford. Also seen is a 'pop-up tea room' on the island platform at Watford station. Tea was served by ‘Tea Darling’ who are organisers of quirky and tailor-made vintage tea parties. This event was run by the London Transport Museum as part of celebrations for it being 90 years since Watford (Met) station opened in 1925. 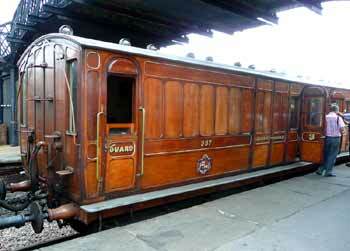 This seven compartment carriage was built by the Metropolitan Railway at its Neasden works in 1900. In 1921 the outer end compartment was rebuilt as a driver's cab of an electric multiple unit train. 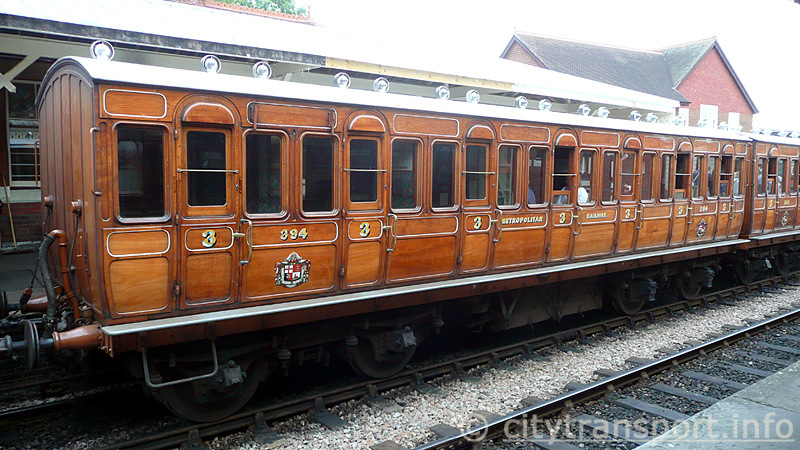 In 1940 it was further rebuilt to become a push-pull control (ie: driving) trailer for the steam powered Chesham service. 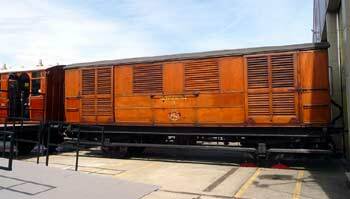 When the Chesham service was converted to electric traction this carriage was specially set aside to become an exhibit in a museum. Nowadays No.400 can be found at the London Transport Museum in Covent Garden, central London. 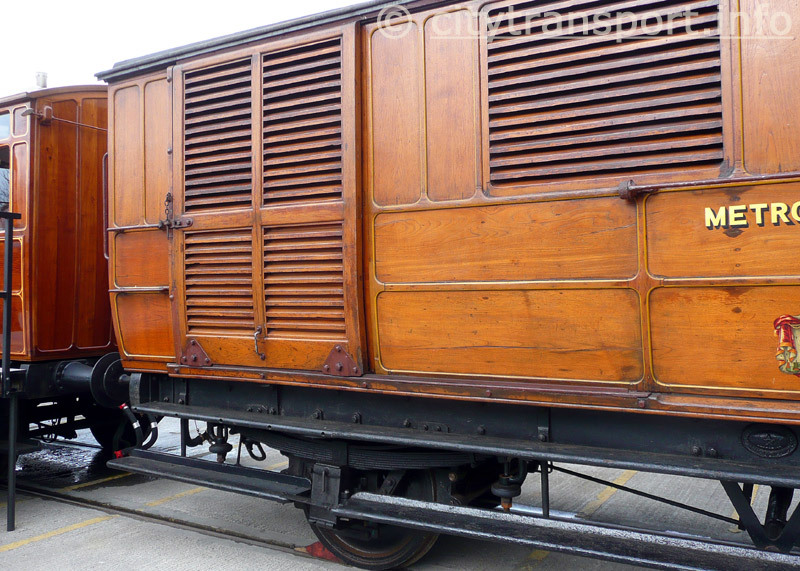 Prior to coming to the museum it was restored externally to its unpainted varnished teak format of the 1920s, when it was used as part of an electric train. 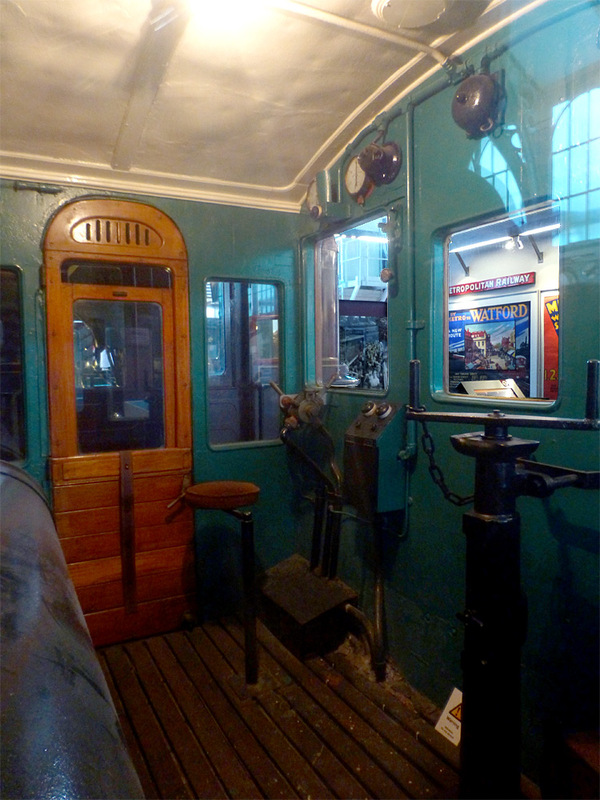 However as it is only used as a static exhibit it still retains the autotrain control equipment which was fitted for the steam powered Chesham shuttle service. 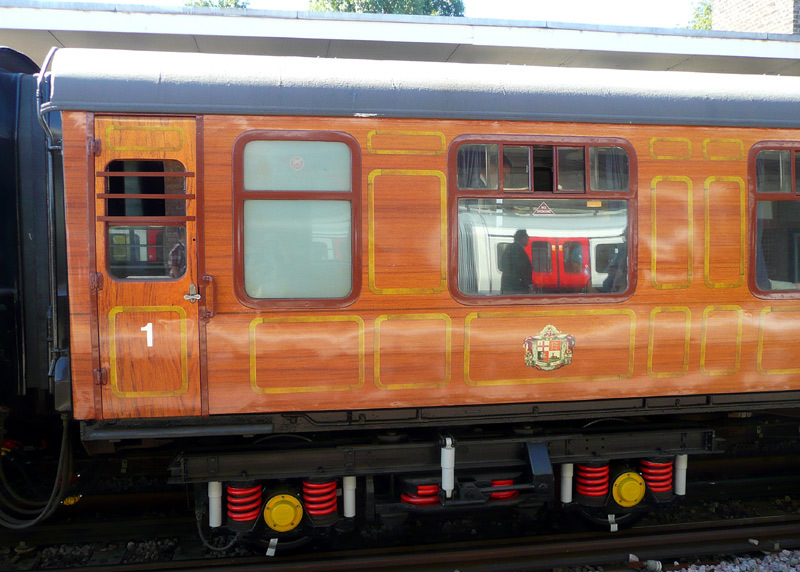 Although the restoration was intended to show the carriage as it was in the 1920s when it worked on the route to Uxbridge, carriage No.400 is fitted with destination boards for Rickmansworth - which between 1925 and 1960 was the northernmost extent of electric traction. Most likely these trains did also serve Rickmansworth - albeit not as part of journeys from London Baker Street station to Uxbridge! This carriage is loosely 'on topic' for a page about vintage and heritage carriages which sometimes still carry passengers on part of the London Transport railway system because one of the compartment doors has been fixed open, so whilst no-one will actually be travelling anywhere museum visitors may enter the compartment and sample the ambiance and seating. This carriage also offers visitors a reminder of something that at one time was a common feature on many railways but in the present era has not been seen demonstrated anywhere else - not even at a Living Museum. This is a Ladies Only compartment. The idea behind these compartments was to reserve part of the train as somewhere where only ladies were admitted, so that they (especially if travelling alone) should be safe from men who would commit sexist crimes - and worse. 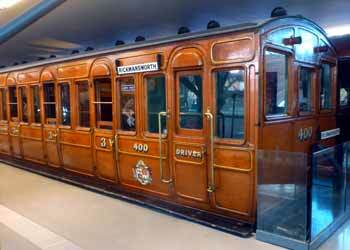 Ashbury Bogie coach No.400 at the London Transport Museum. 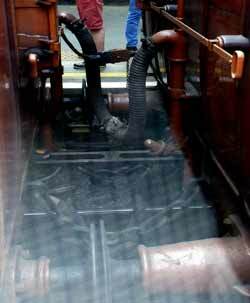 The Ladies Only compartment is next to the compartment which is being used as a train driver's cab. the image also needed to be significantly tweaked to brighten the view. 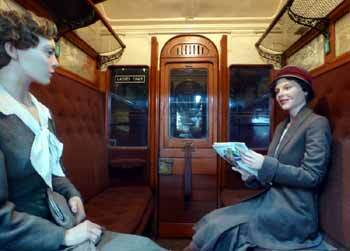 Looking through the open window of the Ladies Only compartment. 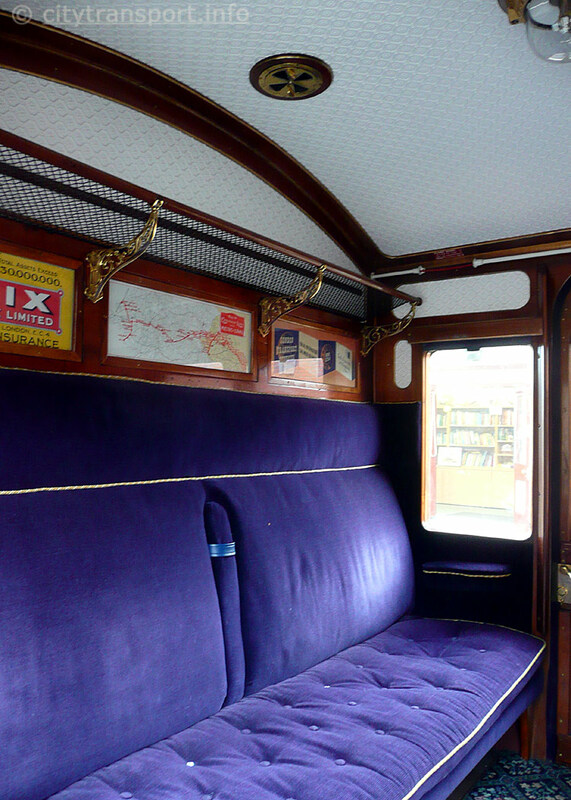 on the far side of the carriage are the communication cord which passengers could use to stop the train in an emergency. 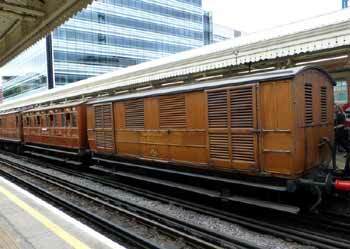 The Metropolitan Railway (the Met) actually built two other fleets of bogie style (8 wheel) hand-operated slam door compartment trains. One of these dates from 1910. 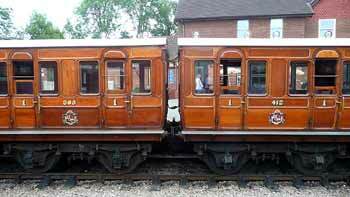 Known as Dreadnoughts, these wood bodied carriages were essentially the same (in format) as those built by the many mainline railways throughout the British Isles. Although some of them were used in electrically powered multiple-unit type trains, most of them were locomotive hauled on Aldgate - Baker Street - Amersham - Aylesbury - Verney Junction services which swapped between steam and electric traction during station stops at either Harrow-On-The-Hill or (after 1925) Rickmansworth stations. 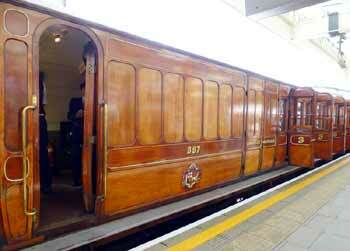 A few of these trains also included a Pullman car which offered freshly cooked light refreshments during the journey. 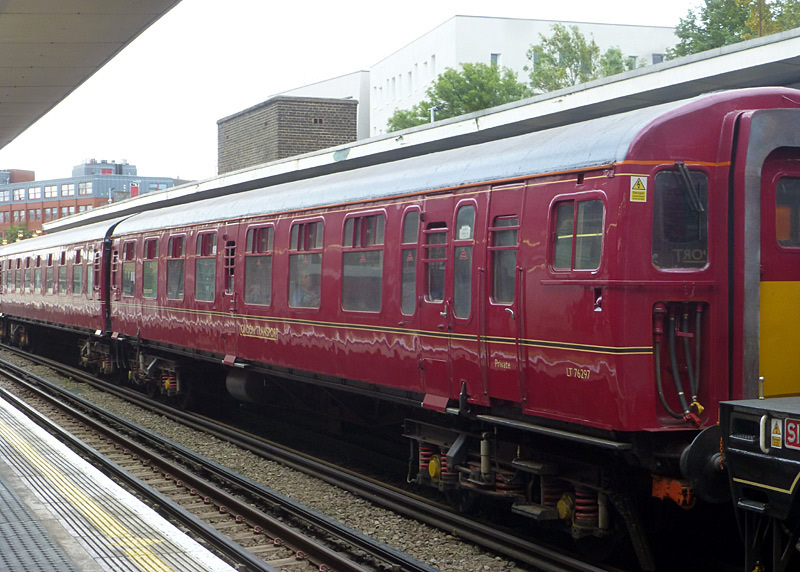 The other fleet of bogie style (8 wheel) slam door compartment trains which the Met built were introduced in 1927, with the last examples being built in 1932, which was the year before the Met lost its independence and was forced to become part of the London Passenger Transport Board - LPTB. The early examples had wood bodies whilst the later versions had steel sides. Built for services to Rickmansworth and Watford, these maroon liveried carriages were of the self-propelled 'electric multiple unit' type. They eventually became known as the T Stock. Neither of these other carriages are illustrated on this page. This is because whilst a few examples remain extant and the Dreadnoughts even still carry passengers (at the Keighly & Worth Valley railway and the Quainton Railway Centre [also known as the Buckinghamshire Railway Centre]) they are no longer used on the present-day London Underground railway network. 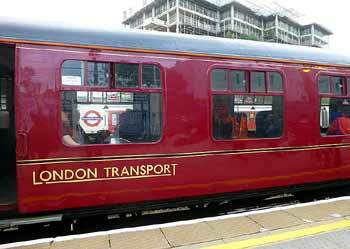 Formerly known as the Metropolitan Heritage Train but nowadays called The London Transport Museum (LTM) Heritage Train this comprises an ex-British Railways Class 438 4TC (trailer control) multiple-unit fixed formation set of four carriages. At each end of the train is a DTSO / driving trailer second open carriage (Nos. 76297 & 76324), between them is TFK / trailer first corridor (No. 71163) and TBSK trailer brake second corridor (No.70283). Travelling in the compartments of the two side-corridor carriages is especially nostalgic, and first class is especially comfortable! Originally the Mk 1 carriages which form the Class 438 trains were locomotive-hauled, they were converted to multiple-unit format by BR at York Works in two batches in 1966-1967 and 1974. In this format they were primarily used on services between London Waterloo and Weymouth. Between London and Bournemouth they operated in push-pull mode with a high power (3200 HP) 4REP four carriage electric multiple-unit attached at the London end of the train, whilst over the un-electrified line between Bournemouth and Weymouth they would operate in push-pull mode with a Class 33/1 diesel locomotive at the Weymouth end of the train (and without the 4REP units). Two sets of Class 438 carriages plus another Mk1 and four Mk2 passenger carriages were purchased from British Rail (BR) in 1992. They were purchased because it was found to be cheaper than hiring rolling stock (from BR), which had been the practice since the first Steam On The Met event in 1989. 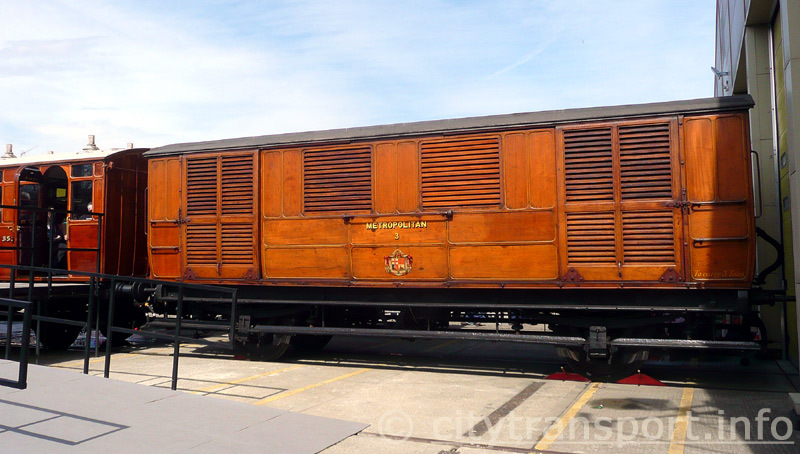 These were all painted in Metropolitan Railway maroon livery. 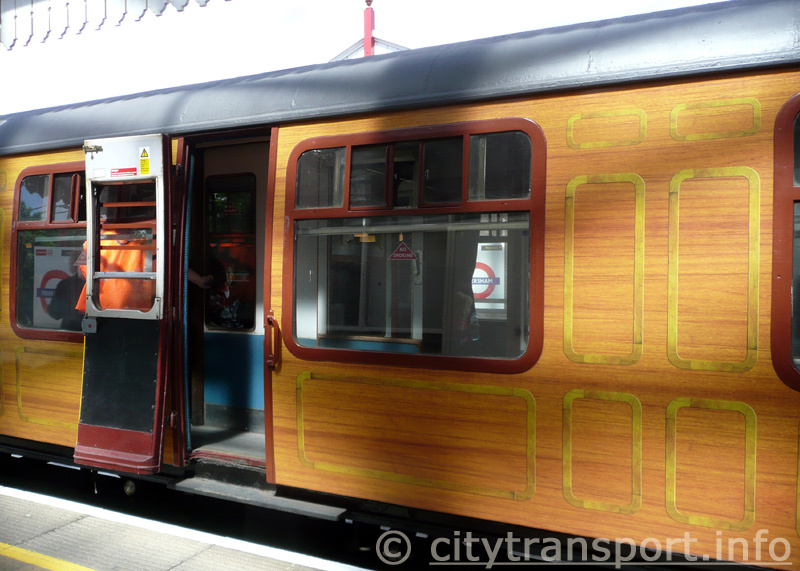 After privatisation of the Underground these carriages were advertised for sale, with one 4TC set and all four Mk2 carriages actually finding new homes with various living museum railway operators. However one 4TC set remained unsold and ended up being used for more leisure events which involved Sarah Siddens and either steam or diesel locomotives. 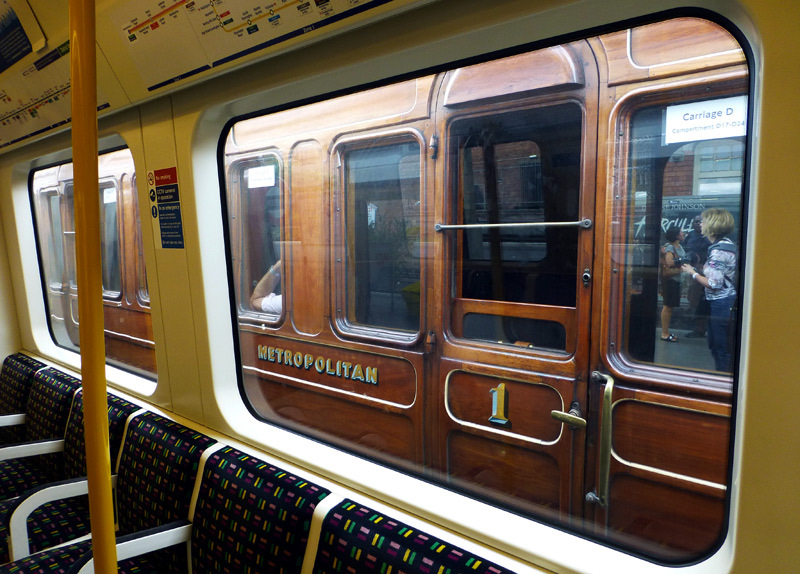 To enhance its new-found status as The Metropolitan Heritage Train it was covered in a vinyl wrap themed along the unpainted teak (ie: wooden) bodied carriages which at one time the Metropolitan Railway used on this route. Typically it is hauled by at least two locomotives (one each end) as this makes it easier to reverse the direction of travel and reduces the chance of the train delaying normal passenger services should one of the vintage locomotives develop a fault and be unable to power the train. This link leads to more information about this type of train at Wikipedia encyclopædia. and used together, forming trains that were five or six carriages long. Here former Metropolitan Railway electric locomotive Sarah Siddons is at the back of a year 2000 Steam On The Met train which includes some former British Rail Mk2 passenger carriages plus what in those days was simply known as a former British Railways Class 438 4TC set. The location is Chalfont & Latimer station. The train with Sarah at its rear is travelling north towards Amersham station. and in the distance (far right), a Cravens 1960 tube stock train is on the bi-directional single track Chesham branch line. Whilst the Class 438 LTM Heritage train has sometimes been lent to living museums its primary use is on leisure-themed special events on suburban parts of the London Underground system, which is very much a working railway (ie: one that carries fare paying passengers) during which time it travels at something nearer to normal speed rather than the very slow 25 mph (40 km/h) speed limit which most heritage railways must observe. 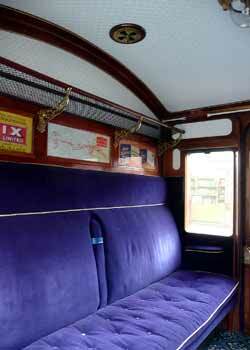 As the train only has a few compartments so only a fortunate few passengers are able to sample this style of seating. Everyone else must travel in the open carriages. Nevertheless, even for these passengers the ride experience is still far better than many present-day trains! As an aside, these photographs also demonstrate what was a common feature of varnished teak carriages, this being that there were often variations in shade (hue, colour depth) between the wooden panels which formed the carriage sides. This was because they come from a natural product of different ages. The side corridor plus some of the compartments can be seen through the window and open doorway. Both driving trailer second open (DTSO) carriages have a driver's cab at one end, this is carriage No. 76324. The trailer brake second corridor (TBSK) includes second class side-corridor compartments & a guard's area with adjacent luggage space. 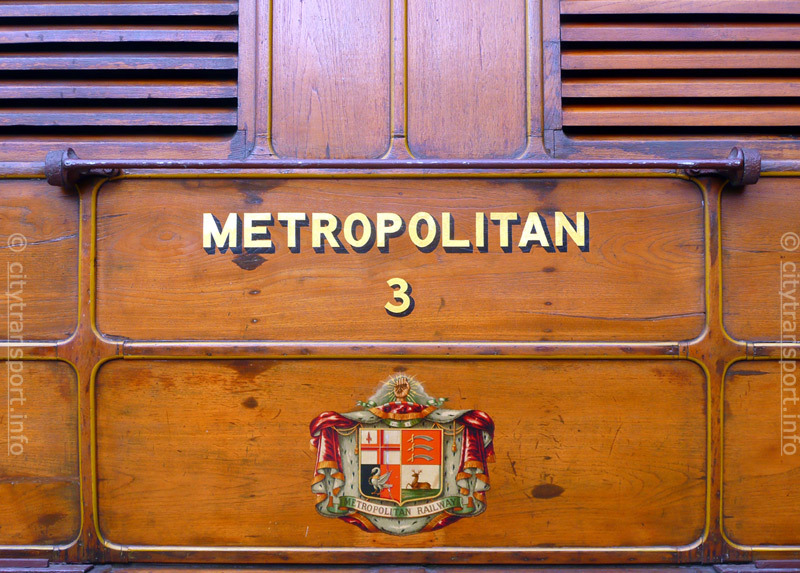 This image also shows that in its guise as the Metropolitan Heritage Train this train carried the Metropolitan Railway coat of arms. with green liveried Class 20 diesel locomotive 20 189 at the London end of the train. This platform is normally only used by southbound trains operated by Chiltern Railways which are travelling to London Marylebone station. A passenger has just boarded one of the DTSO carriages. Photographs with file names that begin ‘P1260’ date from summer 2012. A door which is next to the first class compartments and transcluscent opaque white window which is for the toilet compartment - this allows light to enter whilst still respecting the privacy of the person using the facilities. Unfortunately on this train the toilets are usually locked shut. 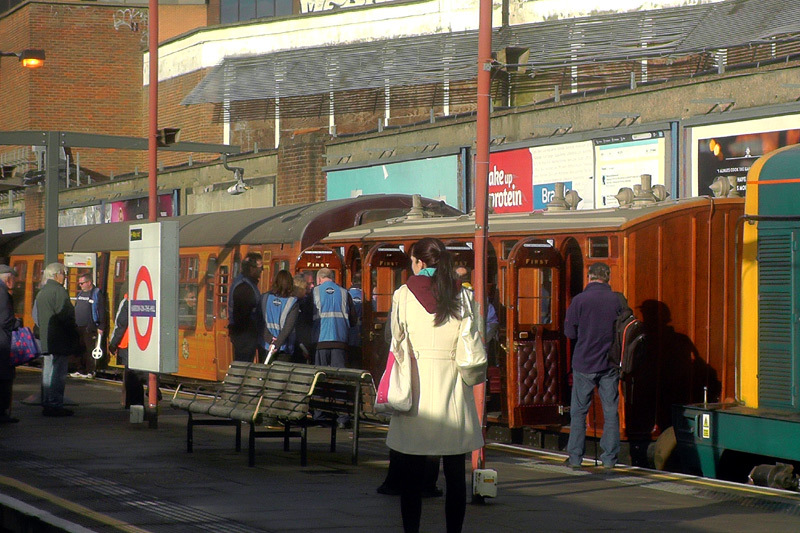 Passengers boarding the (then) Metropolitan Heritage train and Jubilee carriage No.353 at Harrow-On-The-Hill prior to the first of several leisure-themed return journeys to Uxbridge station in December 2014. Also seen is the nose of Class 20 142 diesel locomotive. This was filmed through the glass window of an S Stock train. The special train steams through Rayners Lane Junction. Jubilee carriage No.353 and the diesel locomotive are out of sight behind the S stock train which is travelling towards Harrow-on-The-Hill. After having been stopped at a red signal the special train leaves Hillingdon on its way to Uxbridge. 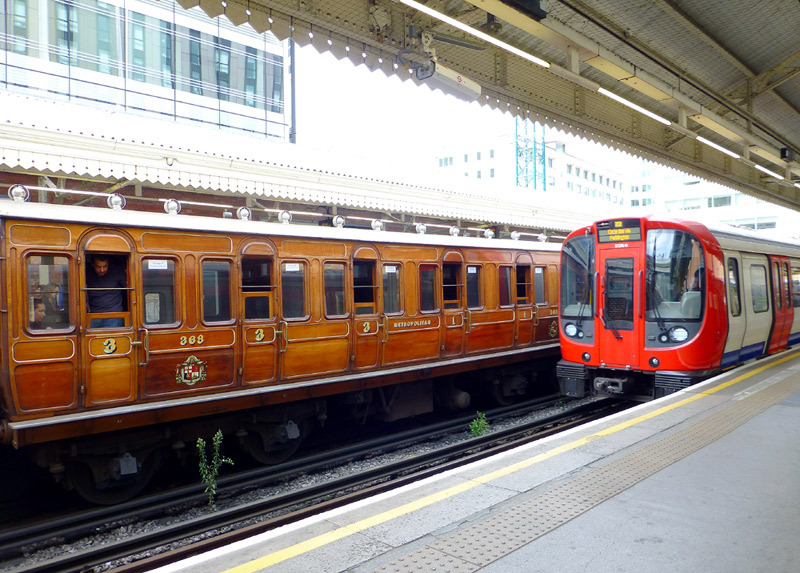 Jubilee carriage No.353 and Class 20 142 diesel locomotive are closest to the camera, also seen is a Piccadilly Line 1973 Tube Stock train. Concrete Cathedral terminus station at Uxbridge. On the far right can just about be seen a Piccadilly Line 1973 tube stock train. To prevent delaying ordinary service trains the LU150 train only stopped here for a very brief few moments. The special train halted at Uxbridge for just about long enough to capture ths view showing the locomotive deep inside the trainshed. Changes in 2017 include this train being repainted into London Transport livery and equipped with an electronic central door locking system. 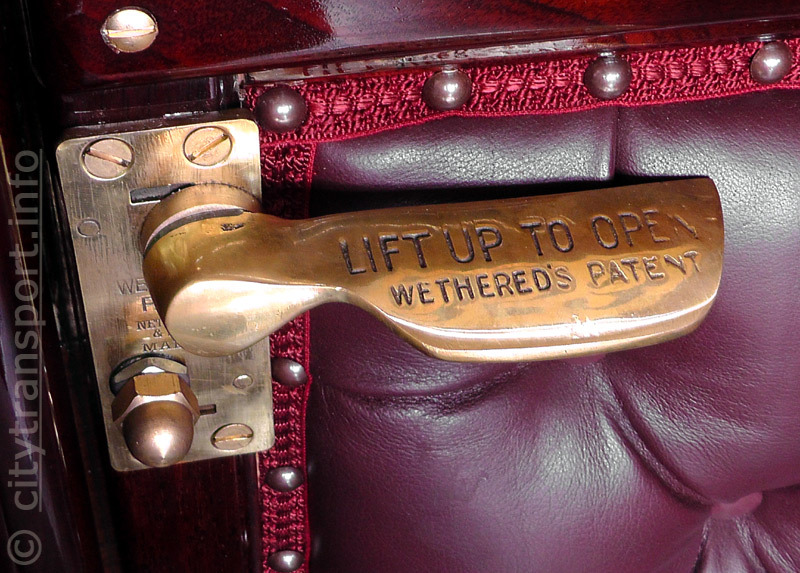 The latter required visible changes to every passenger door in the form of new (somewhat unsightly) metal plates being added to the lower portion of the doors and electromagnets being fitted to the footboards below the doors. Fitting a central door locking system means that it is no longer possible to open the doors when the train is travelling between stations - nor when the still-moving train is slowing down to stop at a station / departing from a station - these being being potentially dangerous actions which some passengers performed when these ‘slam door’ trains were in daily public service. 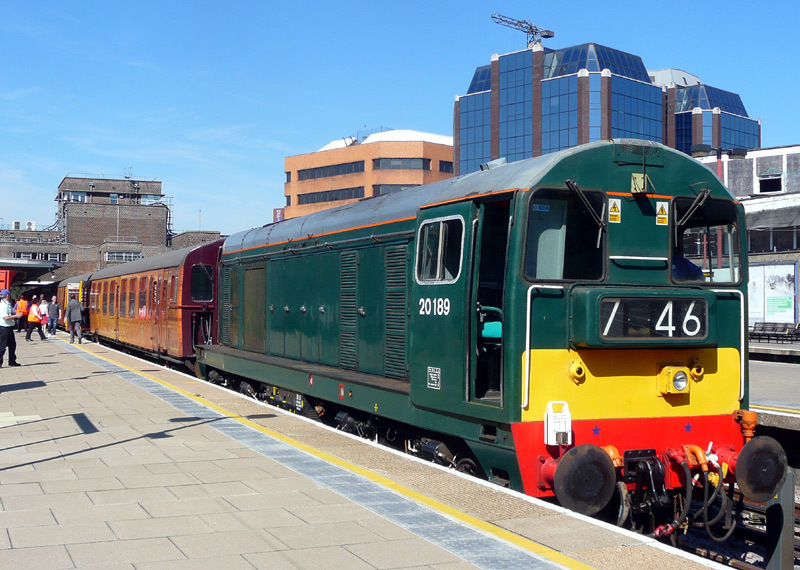 In addition, one of the former British Rail Class 20 diesel locomotives that is often used with this train was repainted to match. Neither of these had actually carried these liveries in the past, but the general public are unlikely to care that they are more pastiche than accurately depicting real history. A completely different way of looking at things suggests that the new liveries are actually helping create a new future history of trains that survived long enough to have second lives! The London Transport Museum Heritage train at platform 2, Harrow On The Hill station. 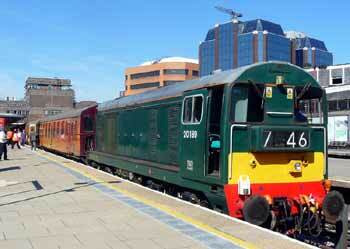 Class 20 diesel locomotive 20 142 after having been repainted into a matching livery and named ‘Sir John Betjeman’. grouped around tables and accurately aligned to the windows. 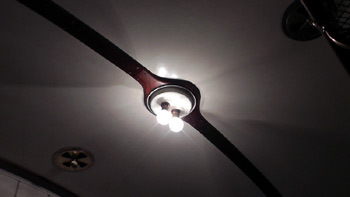 lights that would have been fitted to the train as part of the new central door locking system. The light is located near the top of the train side - between the middle and far right windows. 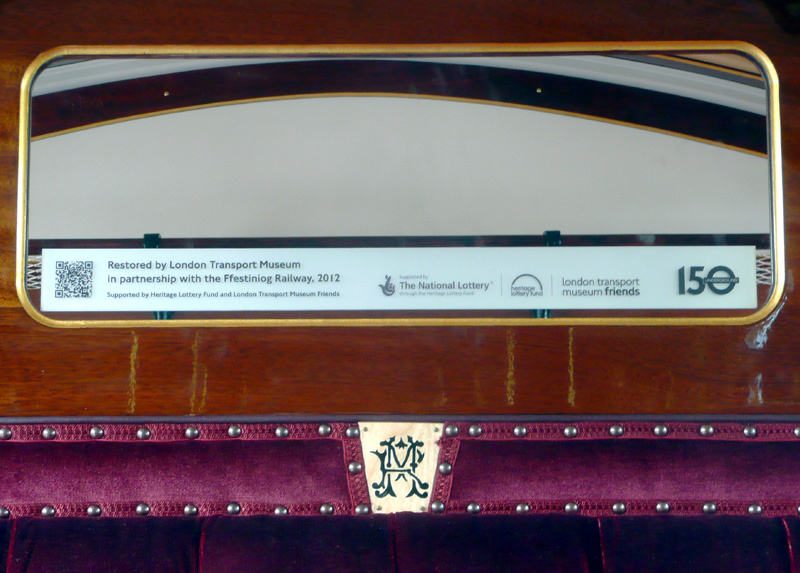 This view includes a closer view of one of the new metal plates which have been fitted to the lower portions of the passenger doors. island platform at Amersham station. Also seen here is a Metropolitan line S8 train. The ‘summer steam’ 2017 Steam On The Met train travelling north passes North Harrow station. Because this train comprises former British Rail MK1 passenger carriages views inside it are seen on a page which is about British Rail MK1 rolling stock. The link to that page is below the links to the video clips. 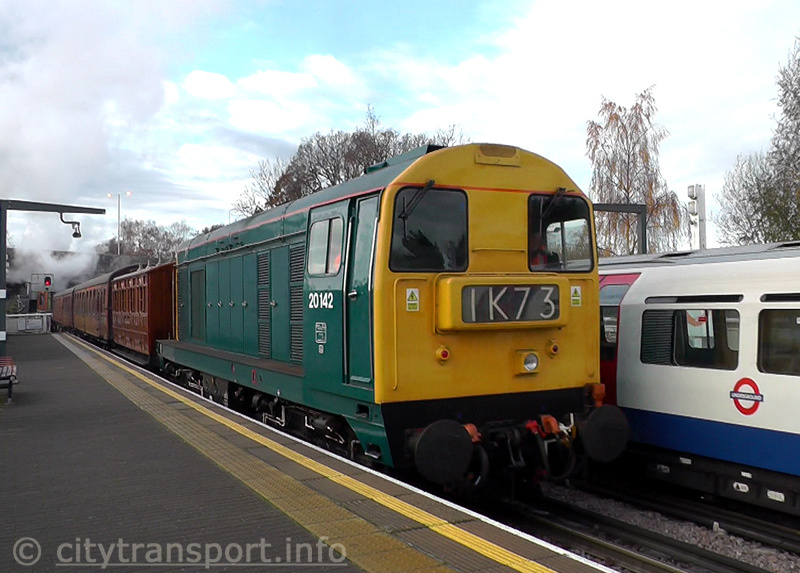 Some videos showing Class 438 trains in action on the Metropolitan line have been placed on the ‘YouTube’ film / video website and can be watched (in new windows) by clicking the links below. The films are grouped according to event. Locomotives: BR Standard 75014, GWR 7325, Metropolitan Railway No.12 (Sarah Siddons), Class 20 227. Also used on the day but not seen here was GWR pannier tank 9466. Every time a train arrived at Amersham station the steam locomotive was swapped out so that the arriving engine could be given more coal and water. In 1996 London Transport had two Class 438 4TC sets, although one of them had temporarily been reduced to three coaches. Therefore this Steam On The Met event saw two steam trains in operation. Each train was five carriages in length with some former British Rail Mk2 passenger coaches running alongside the 4TC (3TC) sets. All the passenger coaches were painted in maroon livery. Each train had two locomotives - one steam and one which was either diesel or electric. Some trains had both locomotives at one end, others had one at each end. Also seen are two Class 165 diesel trains in Network SouthEast livery and an A stock train in original unpainted 'livery'. 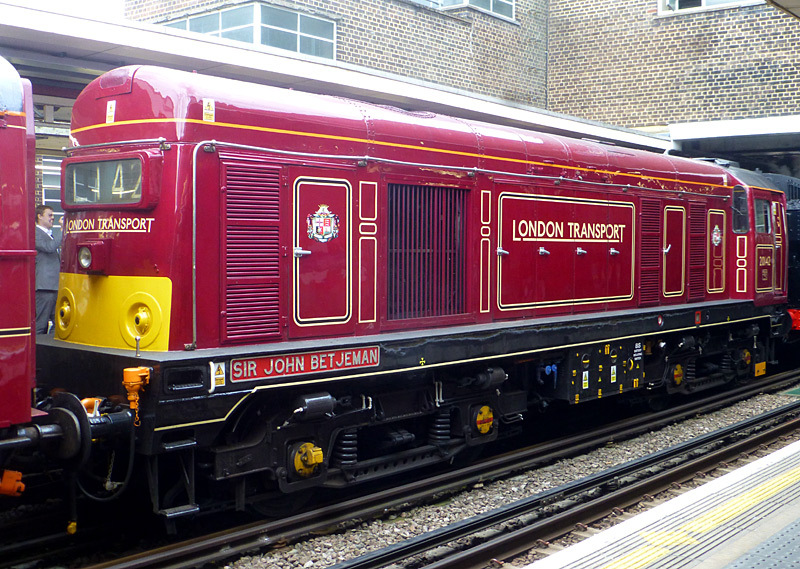 Locomotives: Hauling the train are GWR Pannier Tank 9466 in British Railways livery, Metropolitan Railway Electric locomotive No.12 Sarah Siddons and diesel locomotive class 20 189 in London Transport red livery. 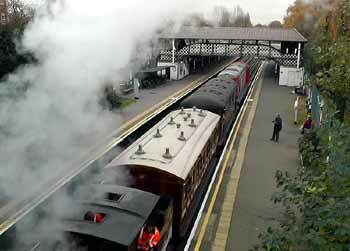 The LU150 steam train passes Northwood station on Bank Holiday Monday 27th May 2013. First it is seen travelling southbound and then northbound. 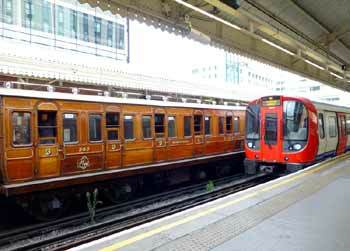 In addition to the Class 438 4TC London Underground Heritage Train this train also includes Metropolitan Railway Jubilee Carriage No.353. Also seen are two S8 S Stock trains, one of which is in promotional LU150 livery. 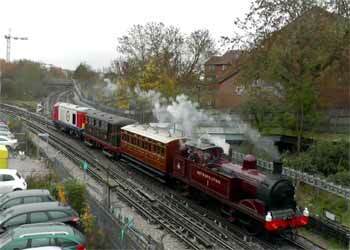 On 8th December 2013 and as the last event of the LU150 1863 - 2013 celebrations, the London Transport Museum ran a steam train on the 1904 Uxbridge branch between Harrow-On-The-Hill and Uxbridge. 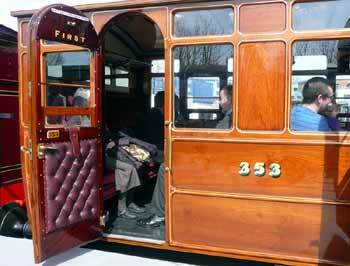 In addition to the 4-TC set these journeys included Jubilee carriage No.353. At some of the locations visited in these films the special train passes normal service trains formed of Metropolitan Line S Stock or Piccadilly Line 1973 Tube Stock. Locomotives: This train was powered by former British Railways Class 20 142 diesel locomotive, Metropolitan Railway electric locomotive No.12 Sarah Siddons and steam locomotive GWR Prairie 4574 Class 2-6-2T No. 5521 which had been painted in London Transport red and numbered LU150. The latter was deputising for Metropolitan Railway steam locomotive No.1 which because of a fault could not be used. Locomotives: This train was powered by no less than four locomotives at the same time! 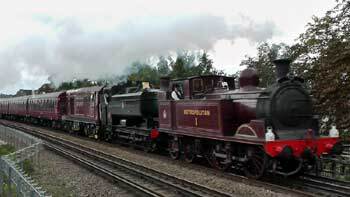 The steam locomotives were Met No.1 and GWR 9466. The diesel locomotives were former British Rail Class 20's - 20 142 (in blue livery) and 20 142 (in London Transport red livery). For passengers the Class 438 4TC unit ran in its new guise as the red liveried London Transport Museum Heritage Train. Click letterbox if you wish to send me an email. This page represents a branchline off the main website so after viewing it should be closed - however in case you arrived here courtesy of a search engine then this link will take you to the Albums pages index http://citytransport.info/Album.htm and this link http://citytransport.info will take to you the opening page of this website. This page last updated 19th October 2017. © Copyright 2001-2019 Simon P Smiler and named image sources.